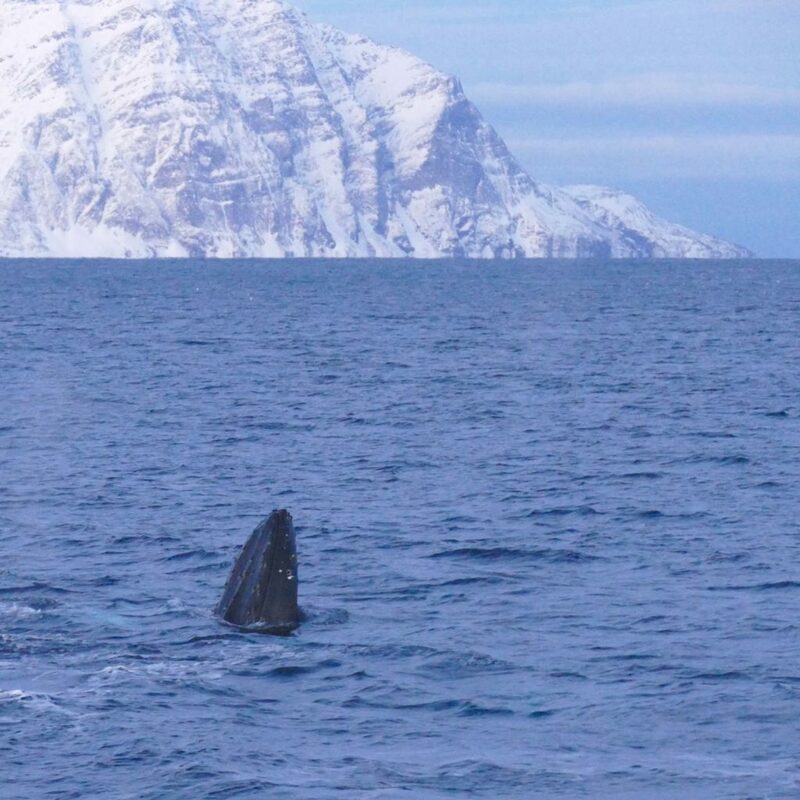 Visiting the whales of Northern Norway. 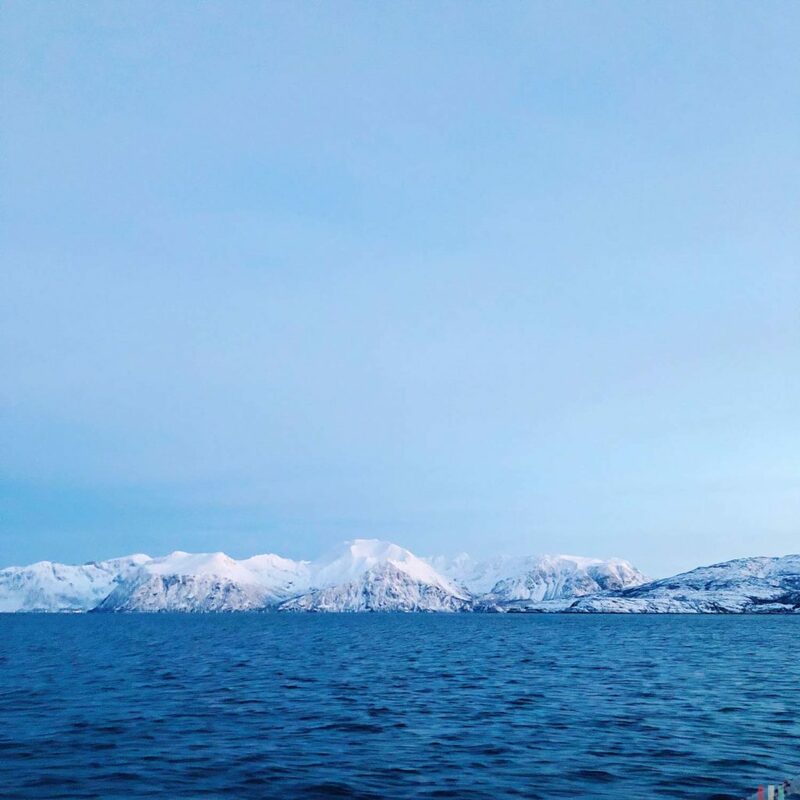 A winter trip to the fjords of Andenes, Senja and Skjervøy. 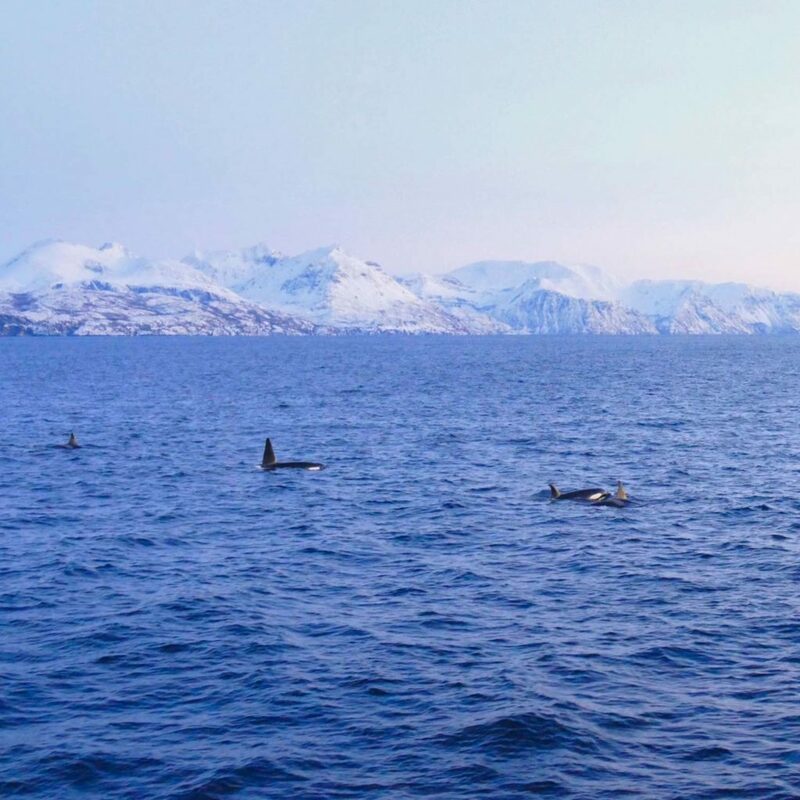 Visiting the whales of Northern Norway. On board of the Southern Star, somewhere between Skjervøy and Kvænangen. 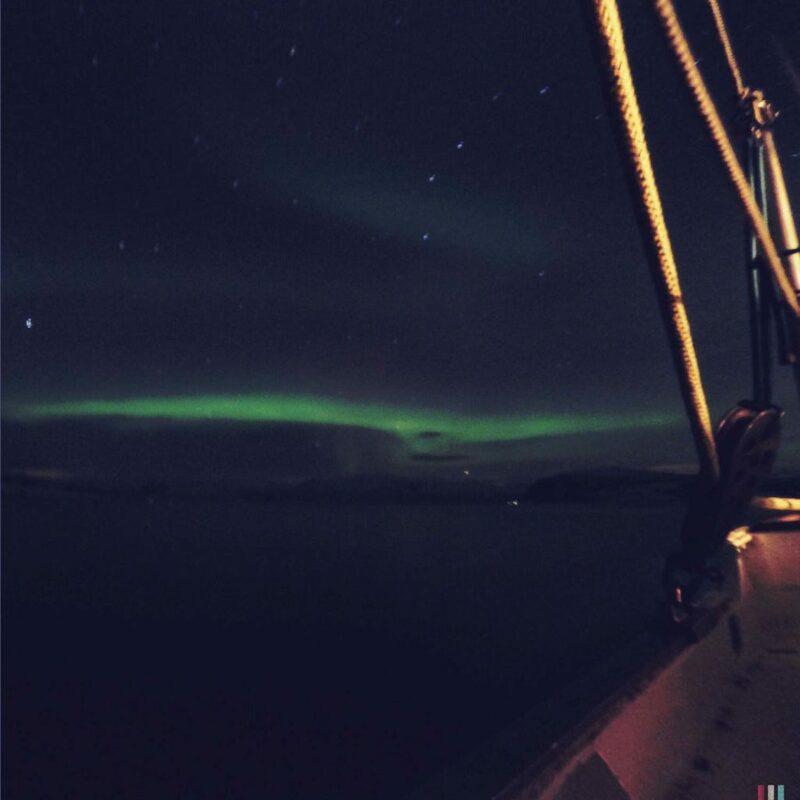 Fjords full of whales, northern lights in the night and a constant fresh, arctic breeze: sailing around in Northern Norway. 69° North. This is north of Iceland, north of most of Greenland’s inhabited parts, north of Arctic Canada, north of Alaska and, yes, north of Siberia. Nobody would think of a winter holiday trip to Siberia. 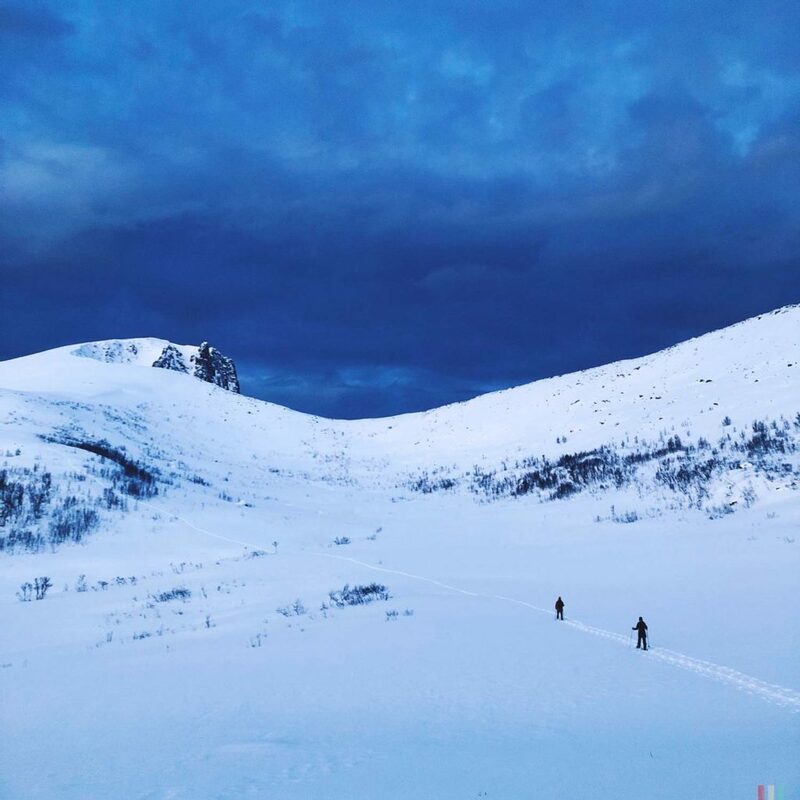 On 69° North you’ll usually find vast tundra and endless ice. Tromsø, on the other hand, provides hotels, cafés, restaurants, shops and an airport. Plus a lot of tourists from all over the world. On our way to Skjervøy. The fjord and the mountains. In contrast to Siberia, Tromsø is really quite busy in winter. The reason is the Gulf Stream, which transports huge amounts of warm water from the Carribean to the north, a gigantic heating system. It’s because of the Gulf Stream, it rarely gets colder than -10 degrees here, whereas everywhere else around 69° North it’s four or five times colder. 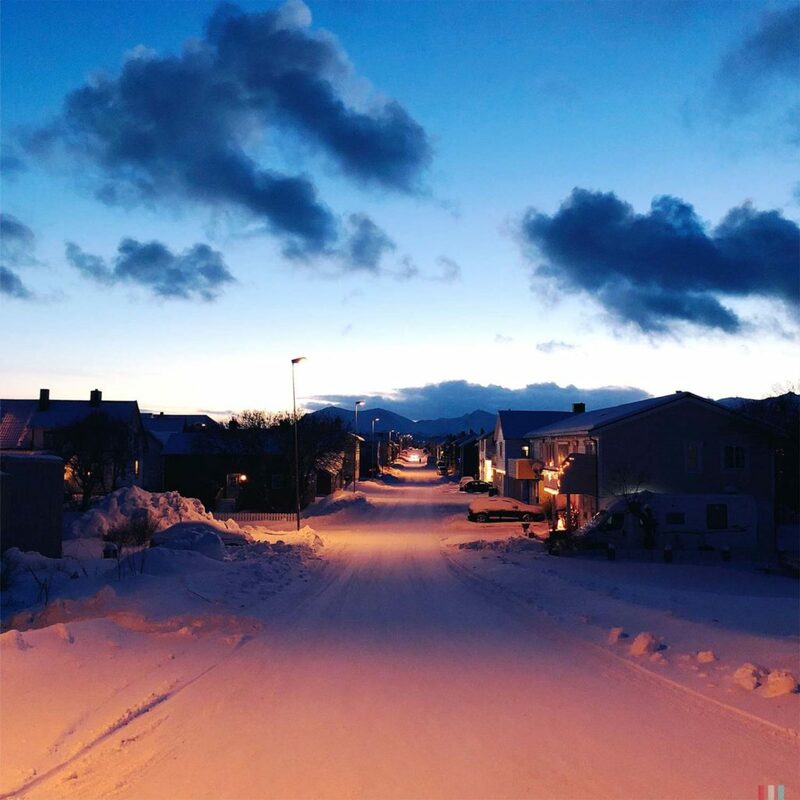 So, Tromsø really is a nice and cozy place to be in winter. Tromsø is located north of Siberia. But in contrast to Siberia, Tromsø is quite well visited in winter. Thanks to the Gulf Stream. And there’s a lot to do here: Watching Northern Lights, meeting the whales, dogsledding, snowshoeing, you name it. 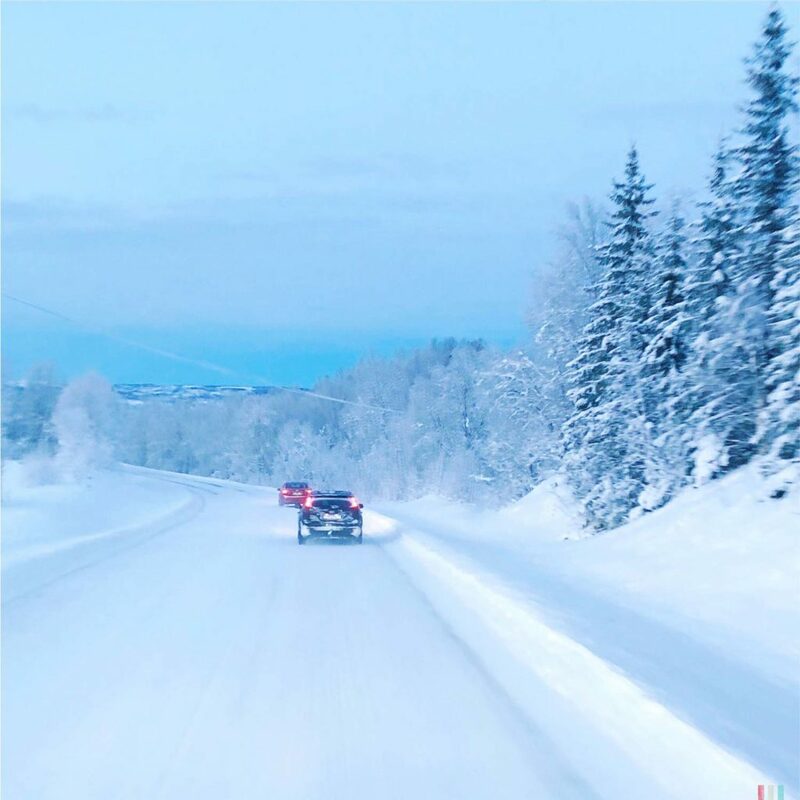 But always make sure to hurry up, for the days are short here: Tromsø is located far north of the Arctic Circle, during winter there is no sun, all you get is a little bit of brightness between 10am and 2pm, shimmering over the endless mountain ranges. The rest is a fancy twilight and complete darkness. 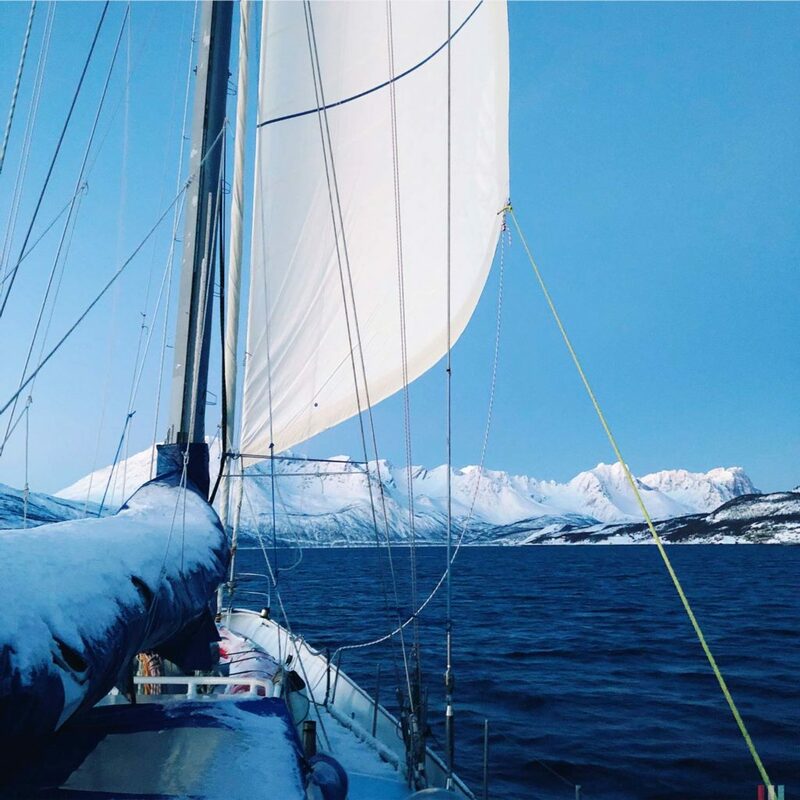 To start our winter trip to Northern Norway we have spent one week on a cute little sailing vessel cruising along the beautiful fjords north of Tromsø. We’ve seen whales every day and Northern Lights every night. 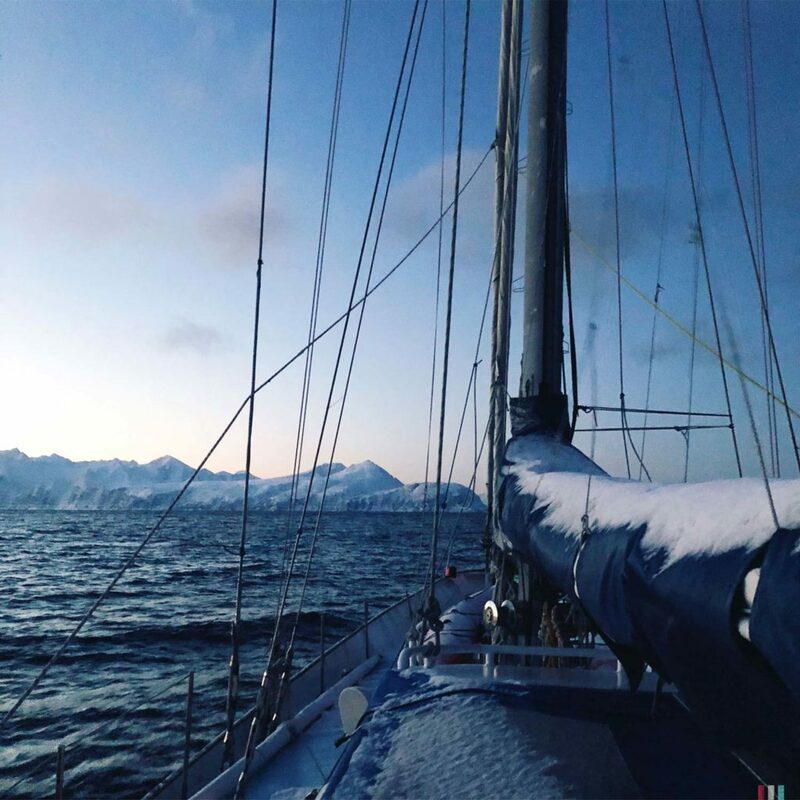 And we’ve learned, that even moderate -10 degrees can feel pretty Siberian, at least if you stay an hour or two in the wind on deck. Gulf Stream or not. 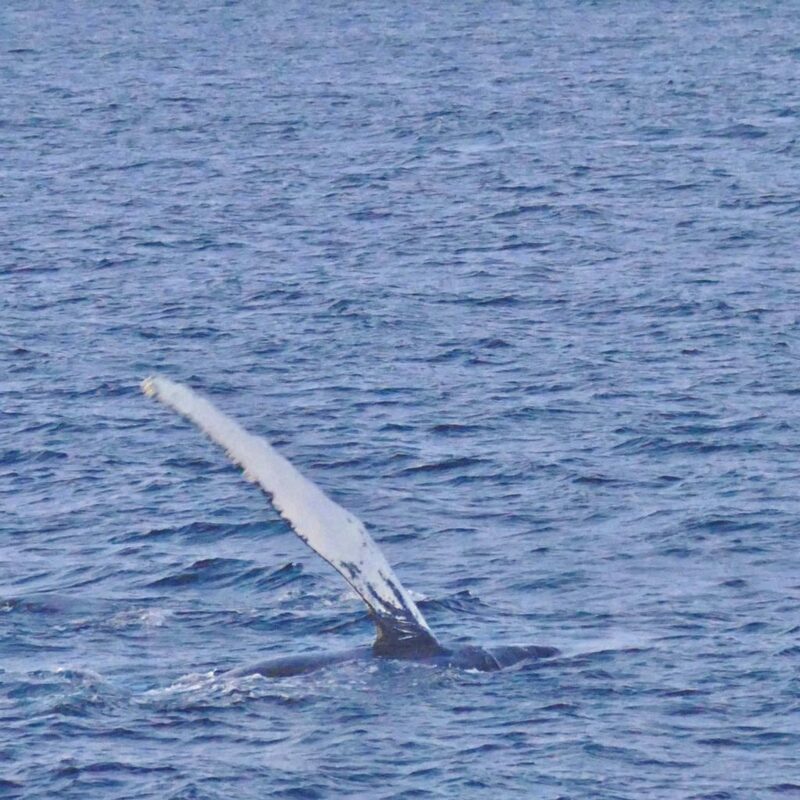 A humpback whale, tailslapping. Somewhere in the fjords of Skjervøy. If you're interested in whales, then you first and foremost should be interested in herring. It's all about the herring here. 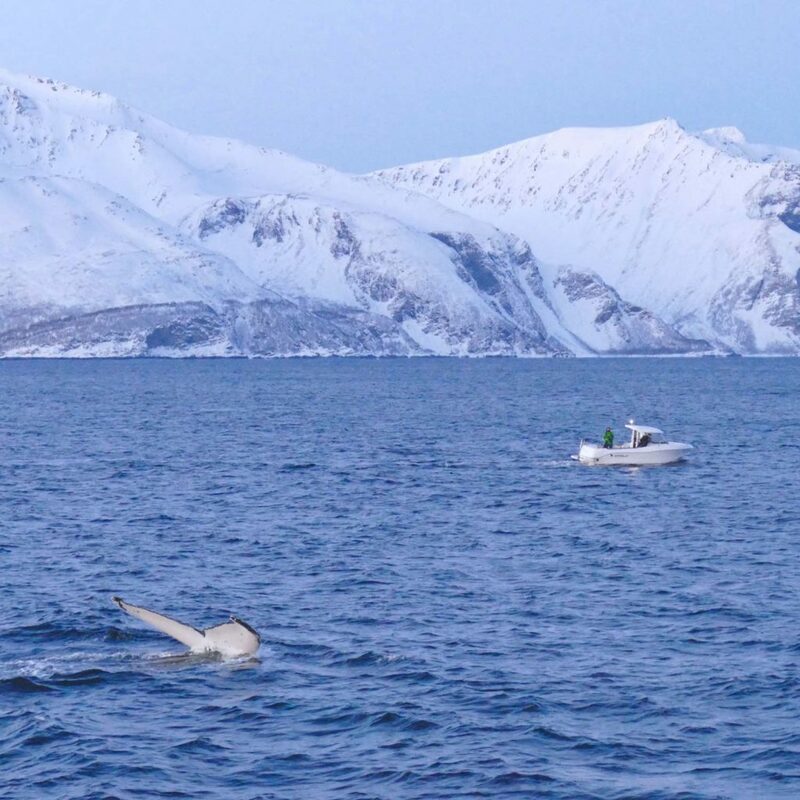 Northern Norway is among the best places in the world for winter whale watching. 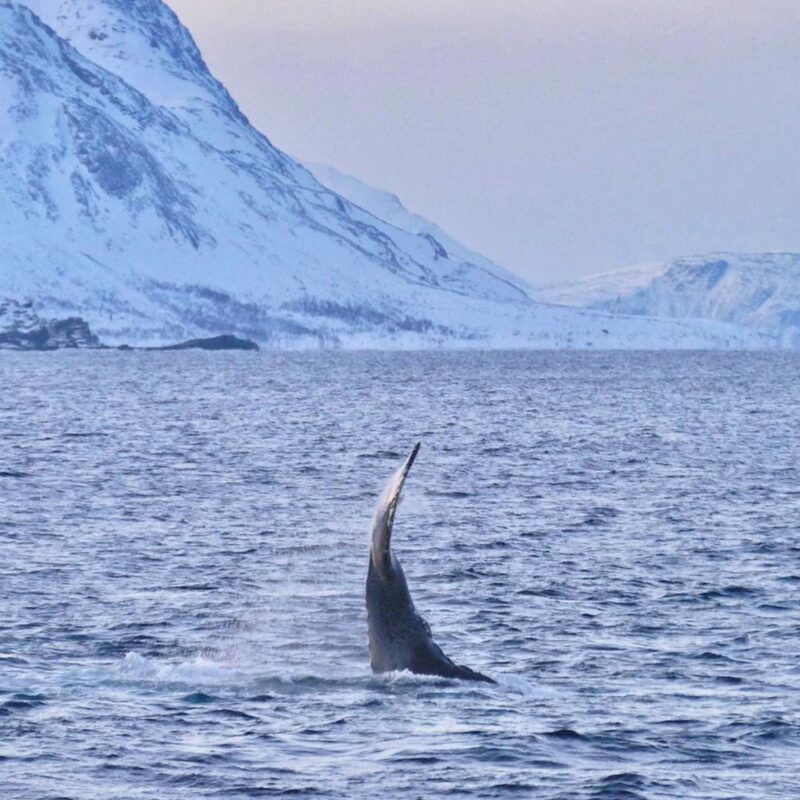 The endless fjords are full of whales and it’s not unlikely to meet fourty, fifty orcas and twenty, thirty humpbacks during a two-hour boat trip. At times it’s even more about evading them – rather than searching for them. Only this winter was different. Once again. Everything depends on the herring here. During the year, the herring migrates between Iceland and the Barents Sea, spending the winter in the vast fjords of Northern Norway. It’s the herring that draws the whales into the fjords in such large numbers. It’s a giant feast for them. However, you can’t rely on the herring. Sometimes it arrives in huge numbers, sometimes in smaller groups, sometimes it moves deep into the fjords, sometimes it stays far away from the coast. Over the years quite a few changes could be seen. 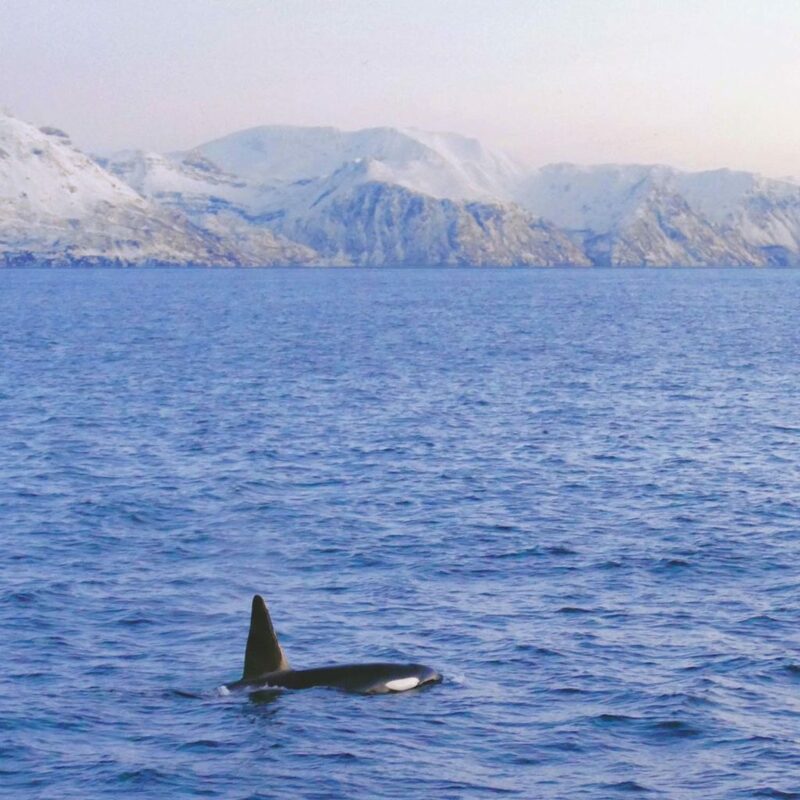 A male orca in Skjervøy. Orca bull, close to the boat. Humpback, going for a dive. The mighty fluke of a humpback. In addition, for some years now the herring has been moving further and further north, probably due to climate change, but no one knows for sure. Overall, only little is known about the herring. There is hardly any research and hardly any data to rely on. Until now, humans have been mostly content to catch the herring by huge numbers. But serious research on herring, on the other hand, is quite a young discipline. 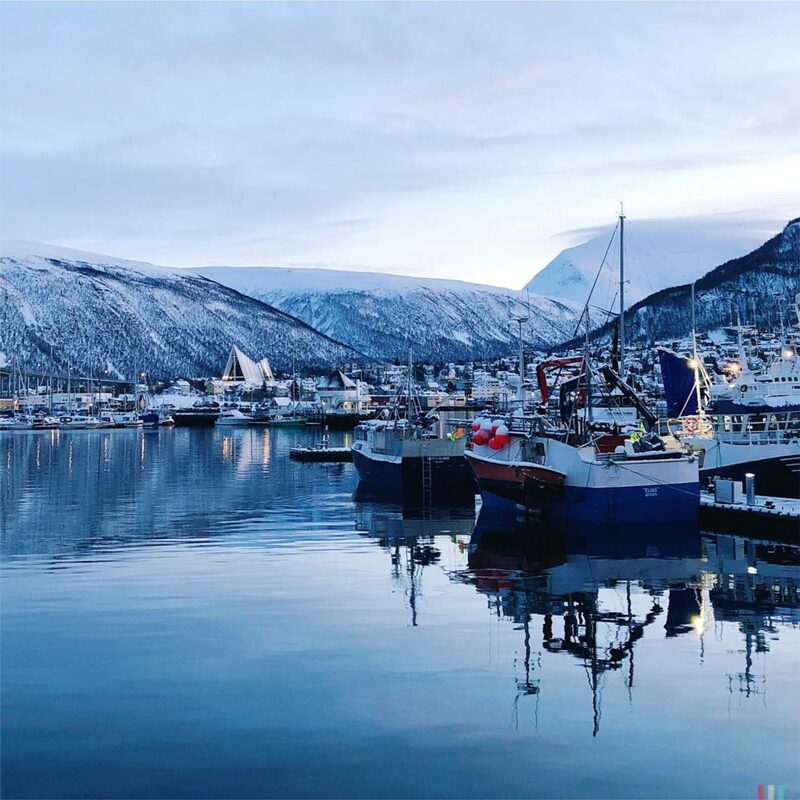 So, we hardly know anything more than what the simple gut feeling of an old experienced Norwegian fisherman would not already know as well. So, this winter the herring decided not to show up. 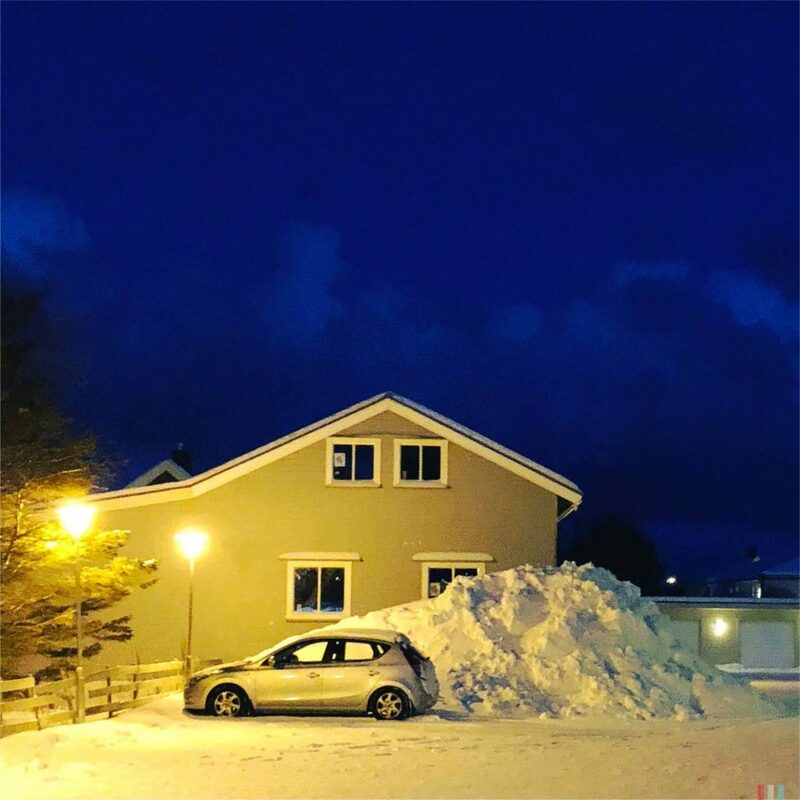 At least not where it was expected – like Andenes, Senja or Tromsø. Instead, friend herring entered the fjords of Skjervøy and Kvænangen, a good 150 kilometers up north. The operators were prepared for the whales to move on at some point. 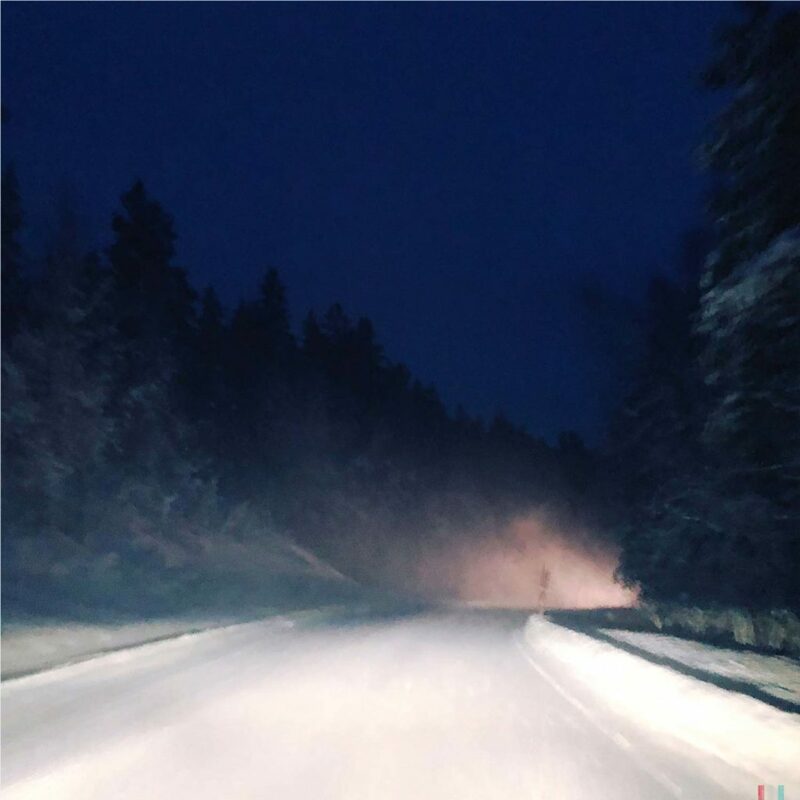 And this winter was the time for it: they went north. A few years ago, the herring acted the same. 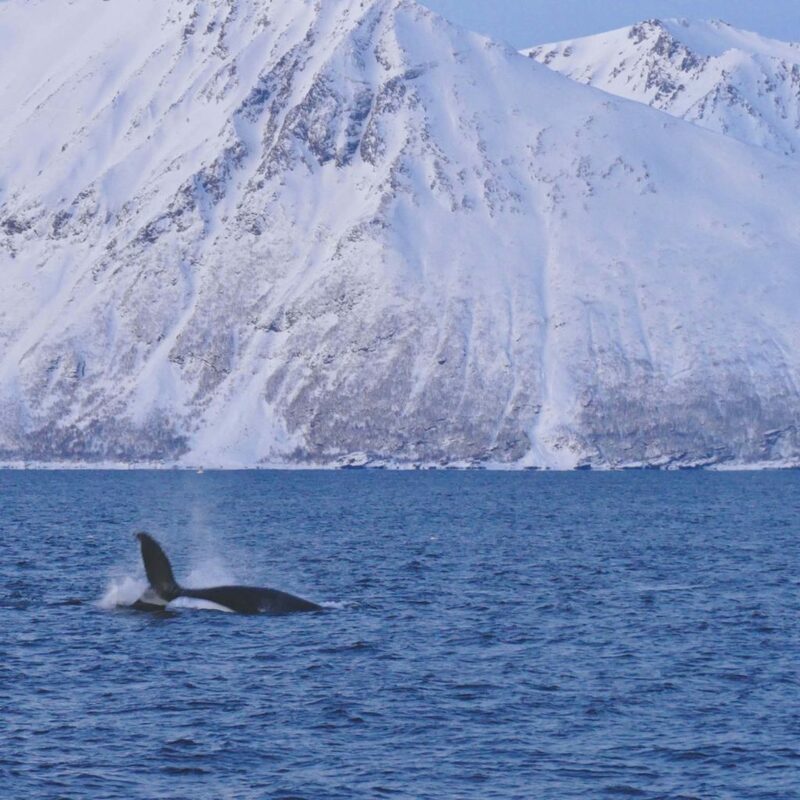 At that time, the Tysfjord was considered one of the best places for winter whale watching in the world. 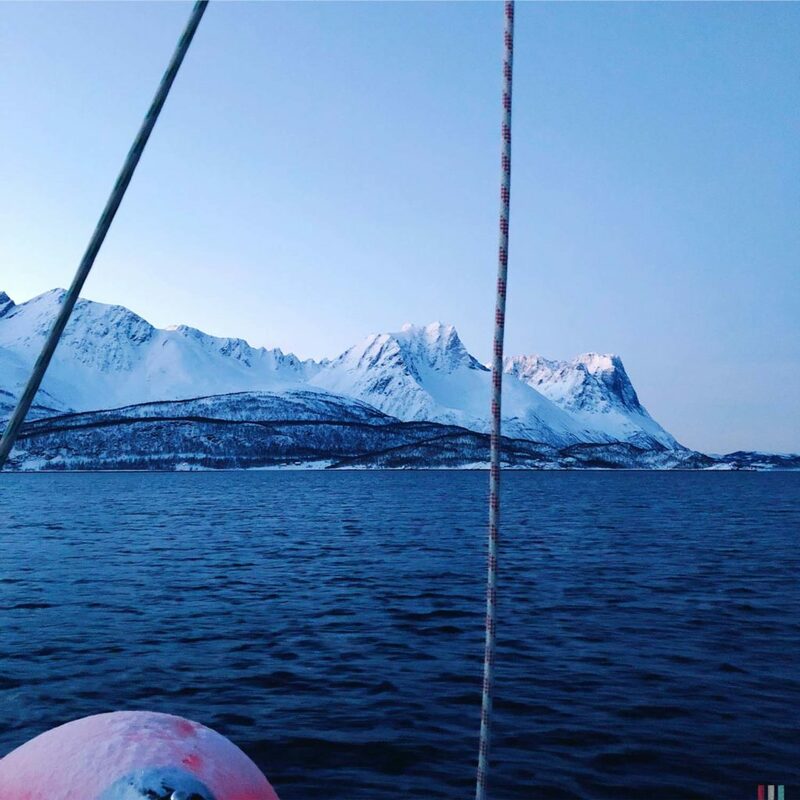 The Tysfjord is located south of Lofoten Islands, a good 200 kilometres south of Tromsø. 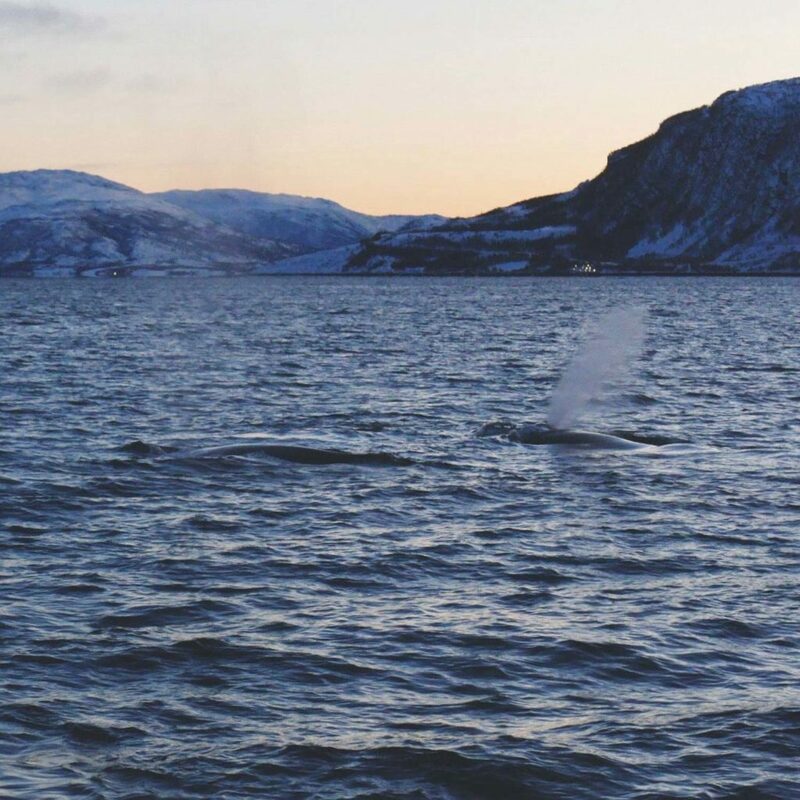 If you wanted to meet the whales during winter, the Tysfjord was the place to be. But one winter, the herring suddenly stopped to visit the Tysfjord. Instead it chose the fjords of Andenes, Senja and Tromsø. 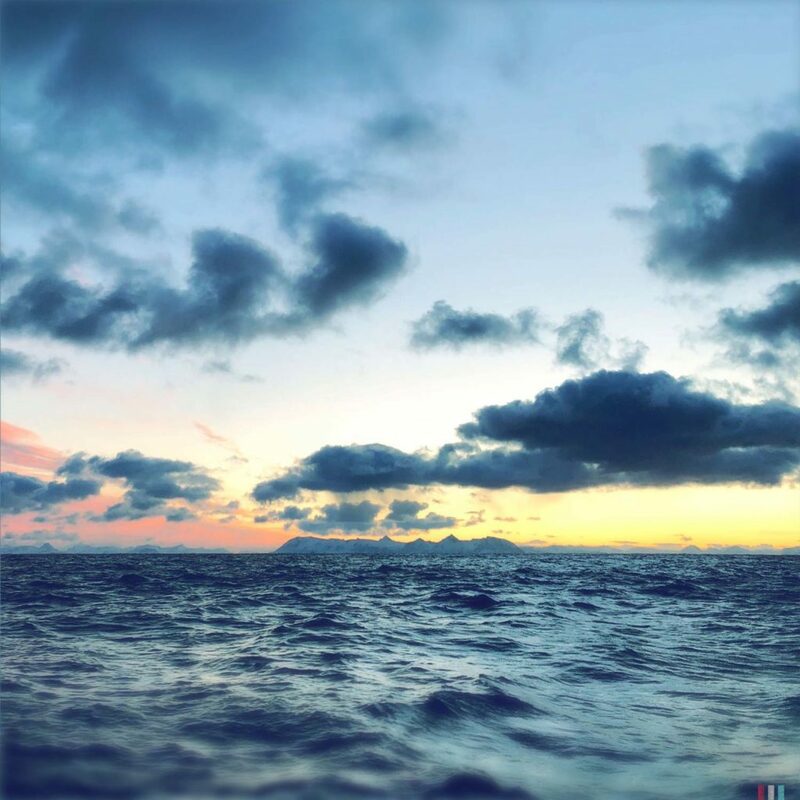 So the whale watching operators decided to carry their guests all the way to Andenes, a five hours drive by ferry and bus – one way. The following years all the whale watchers preferred to go straight to Tromsø. 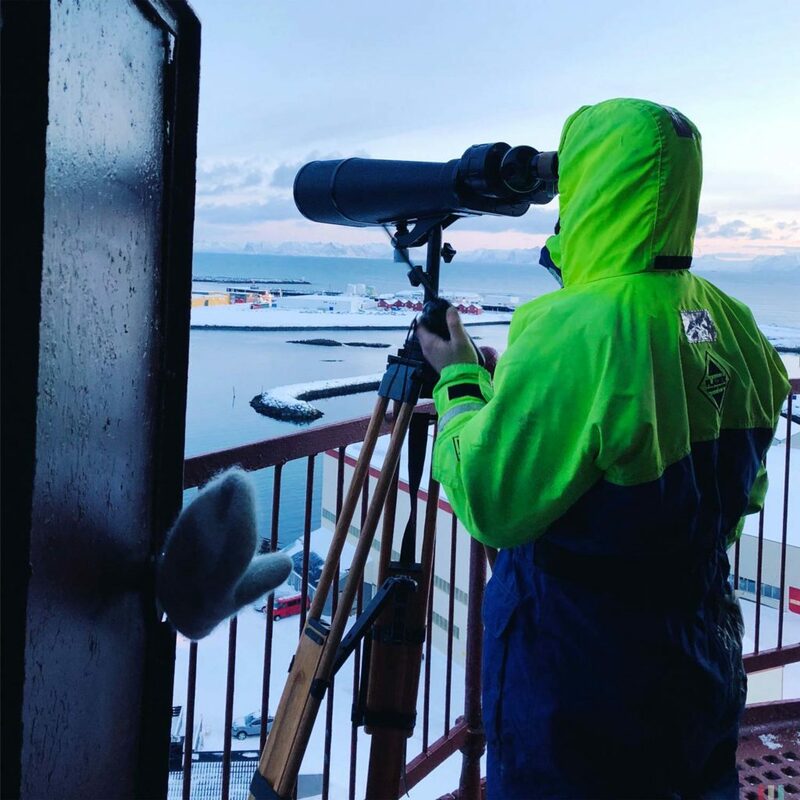 After all, the countless whale watching operators in Tromsø knew what was coming, as the whales would only be a short time business there. 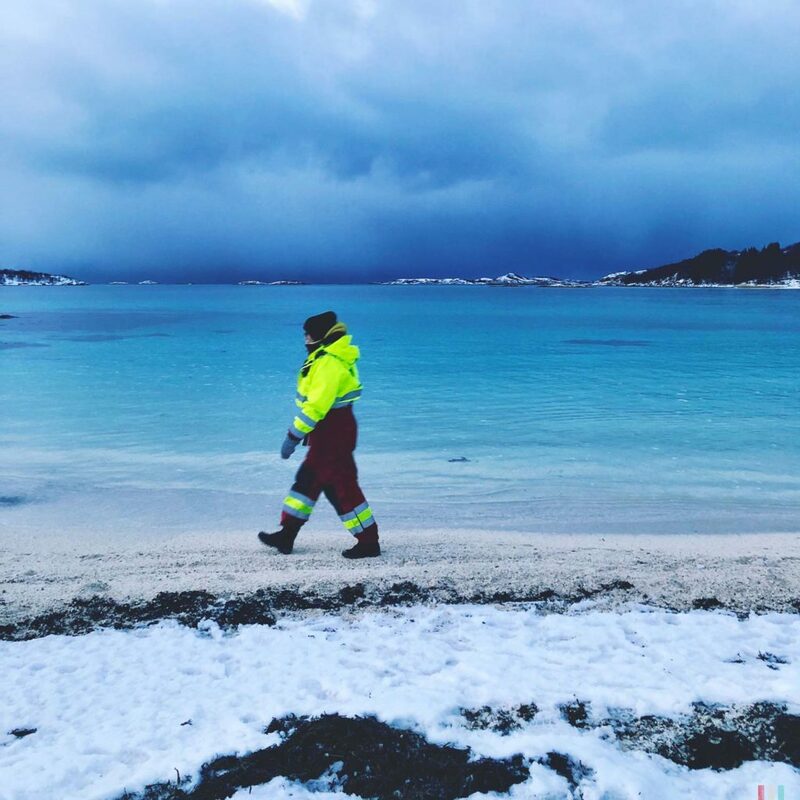 And this winter it happened: the herring moved further north, with Skjervøy the new place to be. Drone video: orcas and humpbacks feasting on herring around Skjervøy. 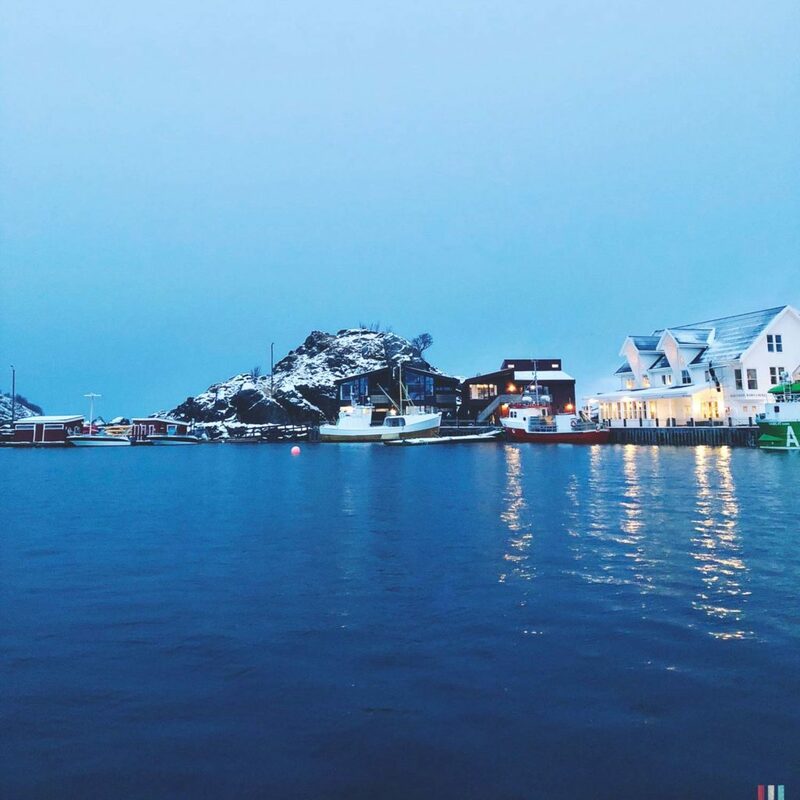 Some operators moved their boats directly to Skjervøy and took the people there by bus – four hours of driving, one way. 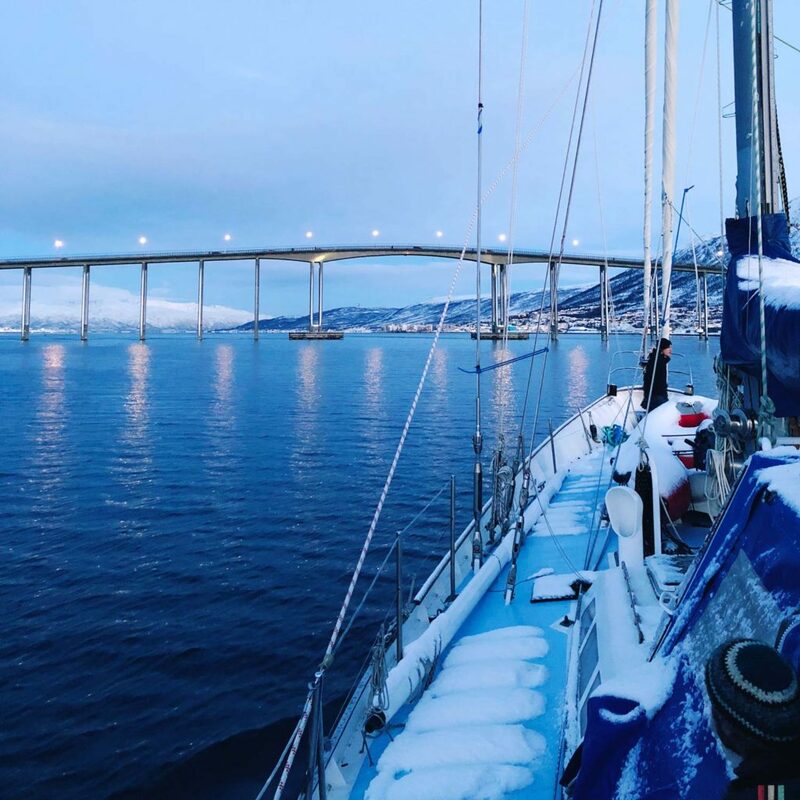 Others left Tromsø early in the morning with fast boats – three hours of driving, one way. 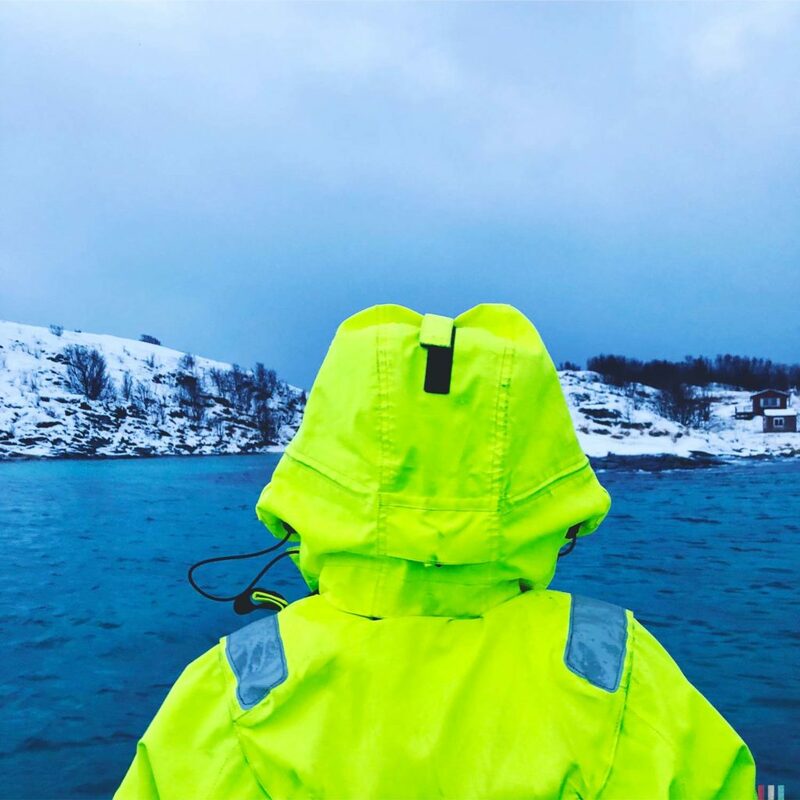 And some few just labeled their former “whale watching tours” into “wildlife tours” and kept visiting Kaldfjord, mainly encountering eagles and seals – and every now and then some occasional orcas. Fortunately, with our little sailing boat we were a bit more flexible. We just went north and stayed around Skjervøy and Kvænangen for a week. And the whales stopped by every day. 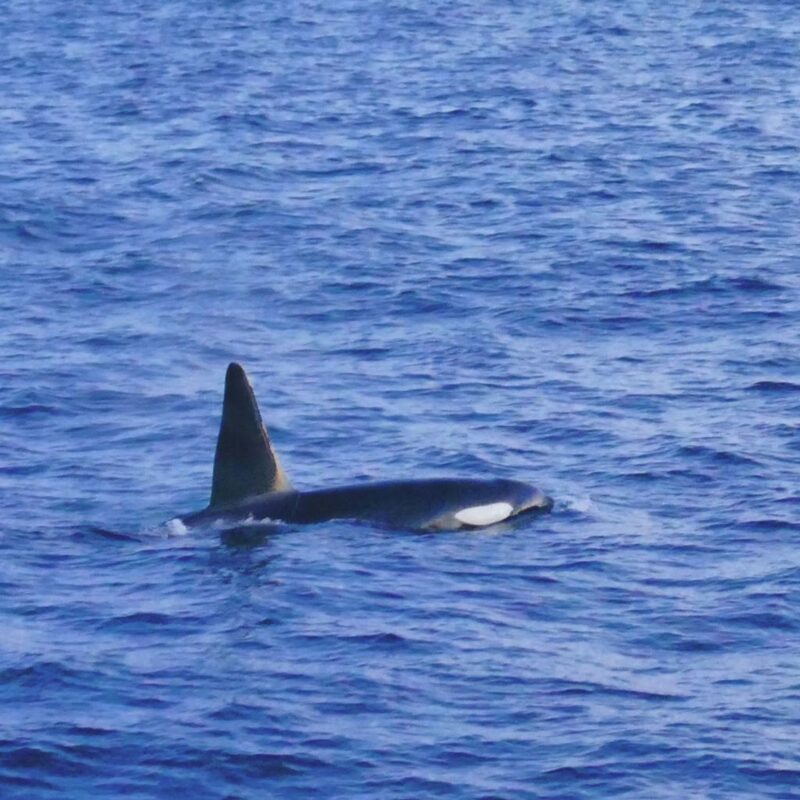 Once some orcas could even be heard through the ship’s hull right in the middle of the night. 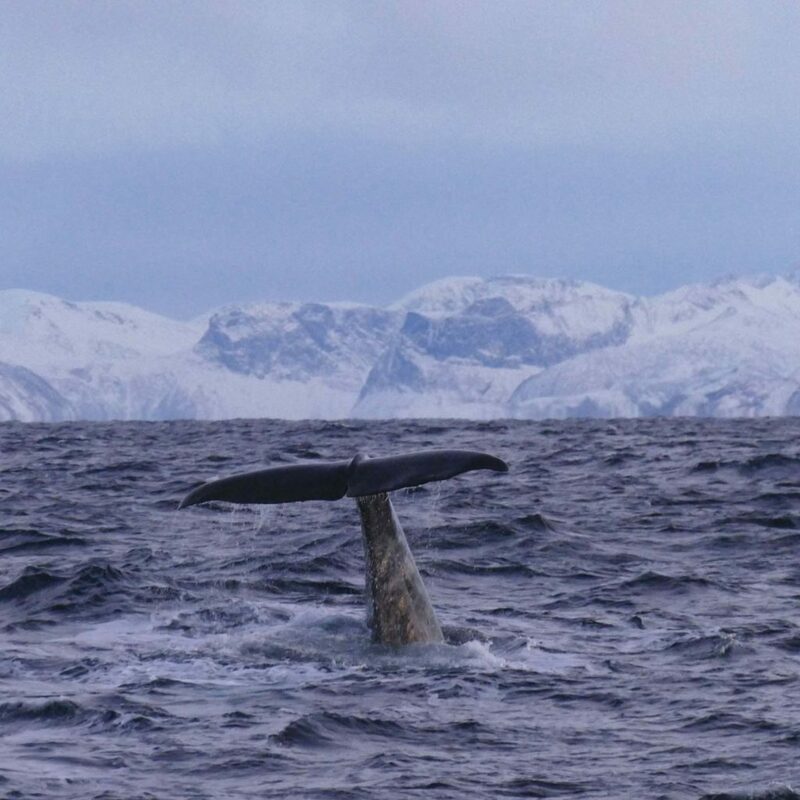 We very much recommend extended sailing trips for winter whale watching in Northern Norway. Dag, enjoying the view over the beautiful Bergsfjord, all the way to Andenes. 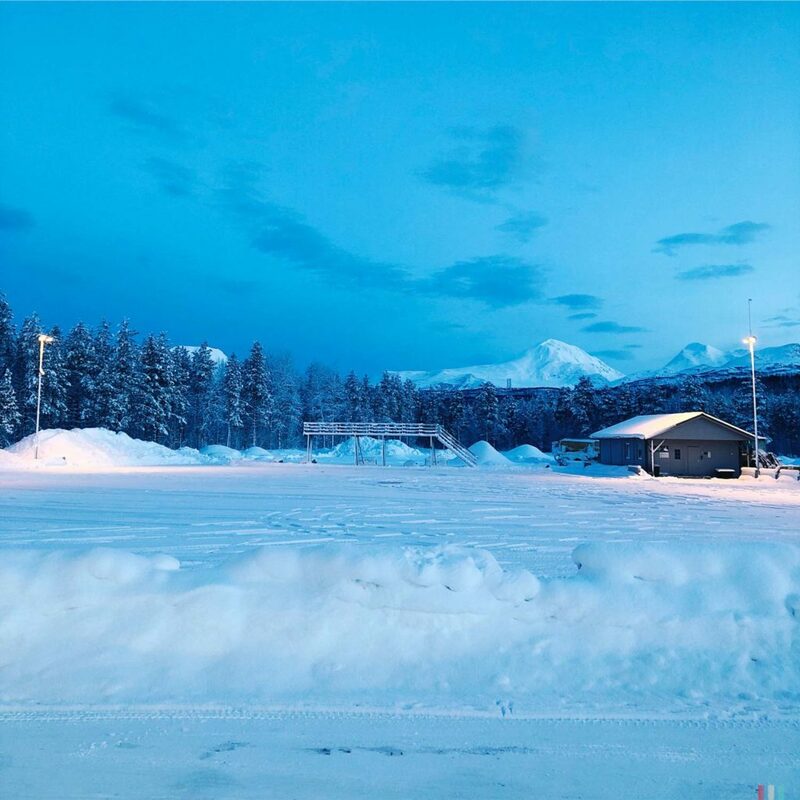 Back to Senja, where it all started for us a few years ago. 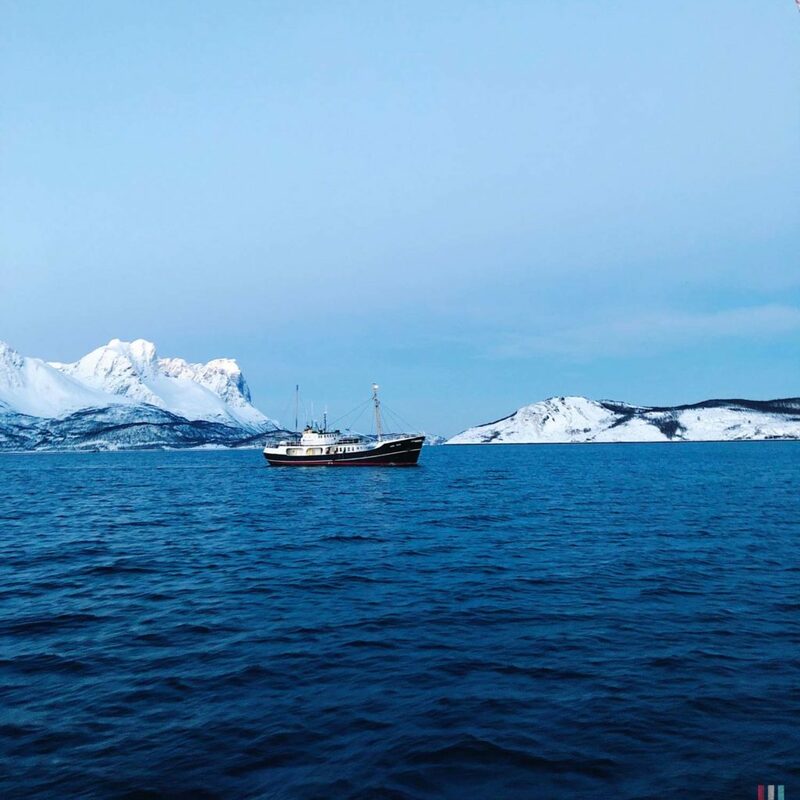 This time we learned how spectacular Northern Norway is, even without the whales. 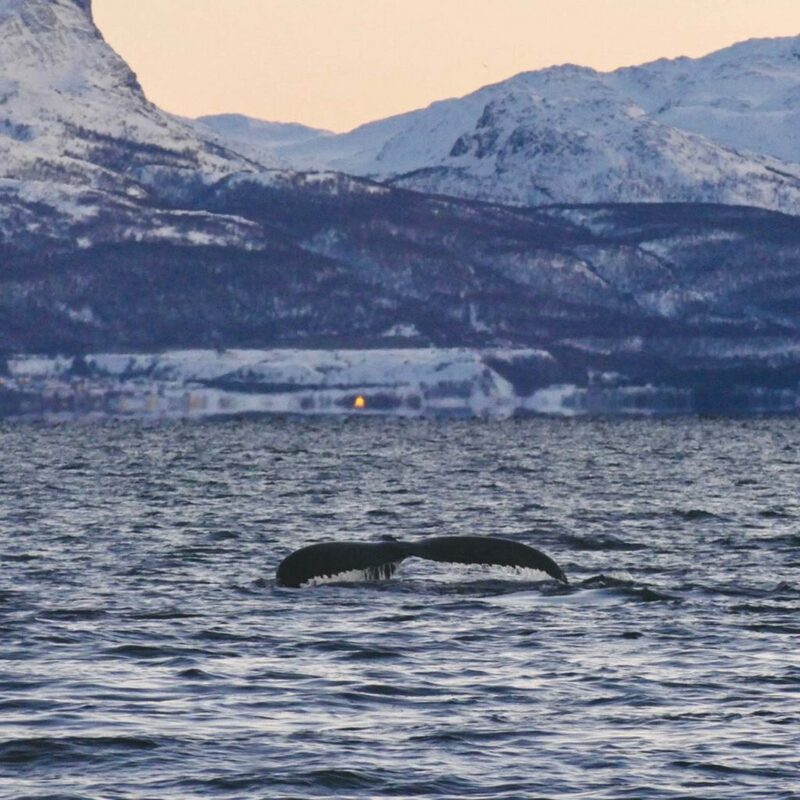 We already knew before we took our ferry to Senja: this year, the whales won’t be there. Still, we were so happy to get back. 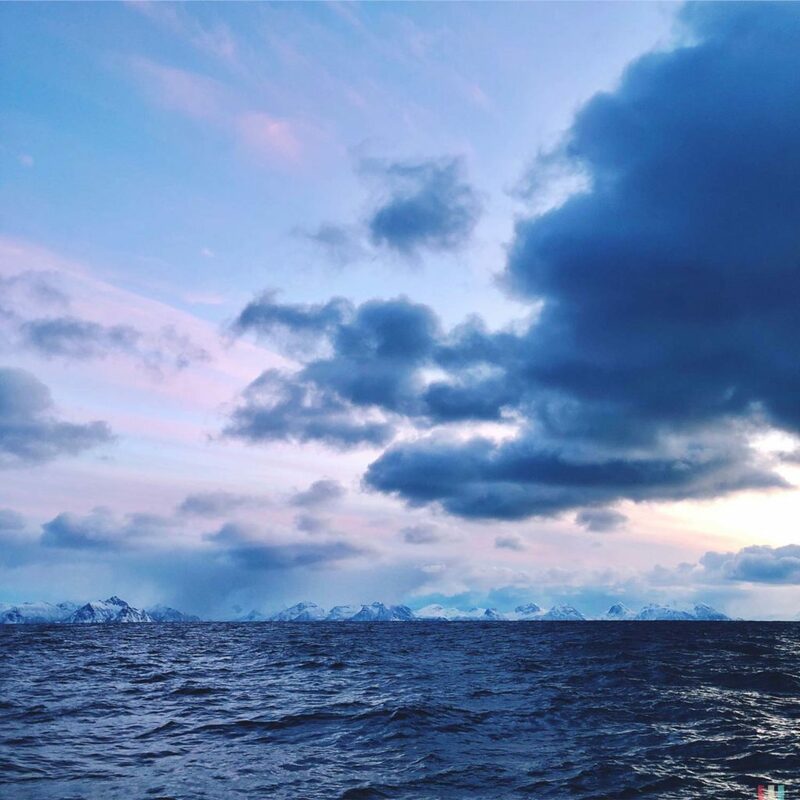 For us, it all started here: A few years ago, we spent some great days with Trude and Dag at Basecamp Senja, and the Bergsfjord was so full of whales you could even hear them breath from land. 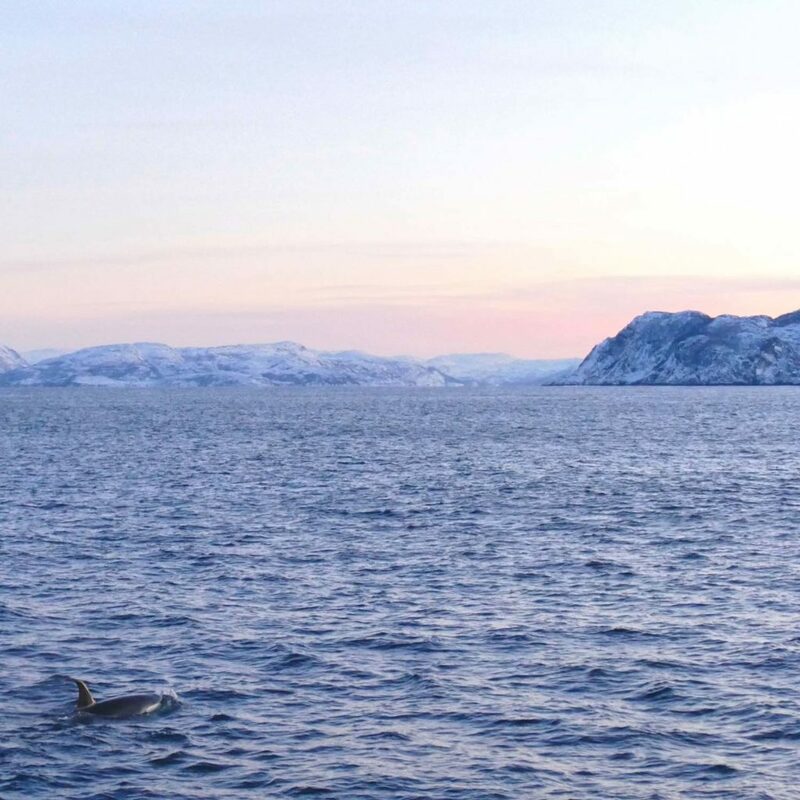 It was the second winter the whales had come to the Bergsfjord, and Dag already knew that they might visit this area for the next five or six winters before the herring would move further north. It’s been five years. 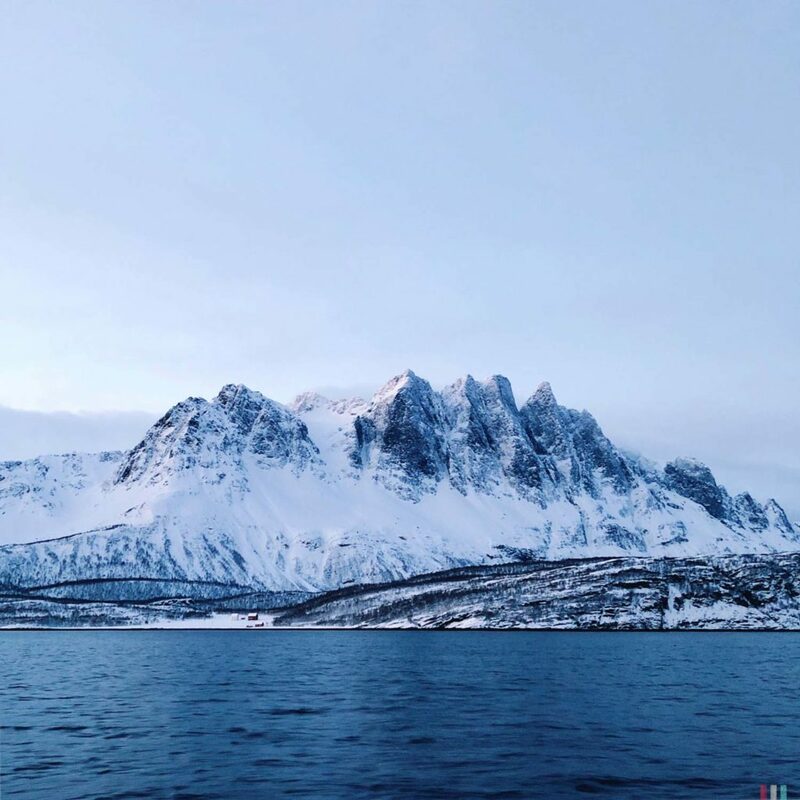 Senja is the second largest island of Norway – and a true sensation in terms of landscape. 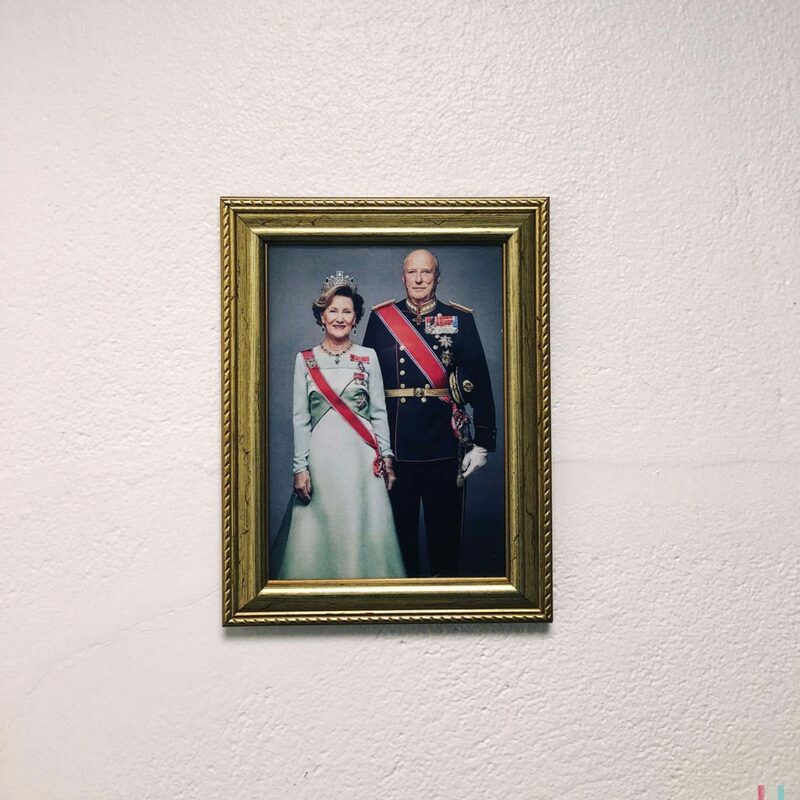 The Basecamp is a lovely old former post office which Trude and Dag had completely renovated. It’s located right at the Bergsfjord, with it’s about hundred tiny islands surely one of the most beautiful fjords in Norway. 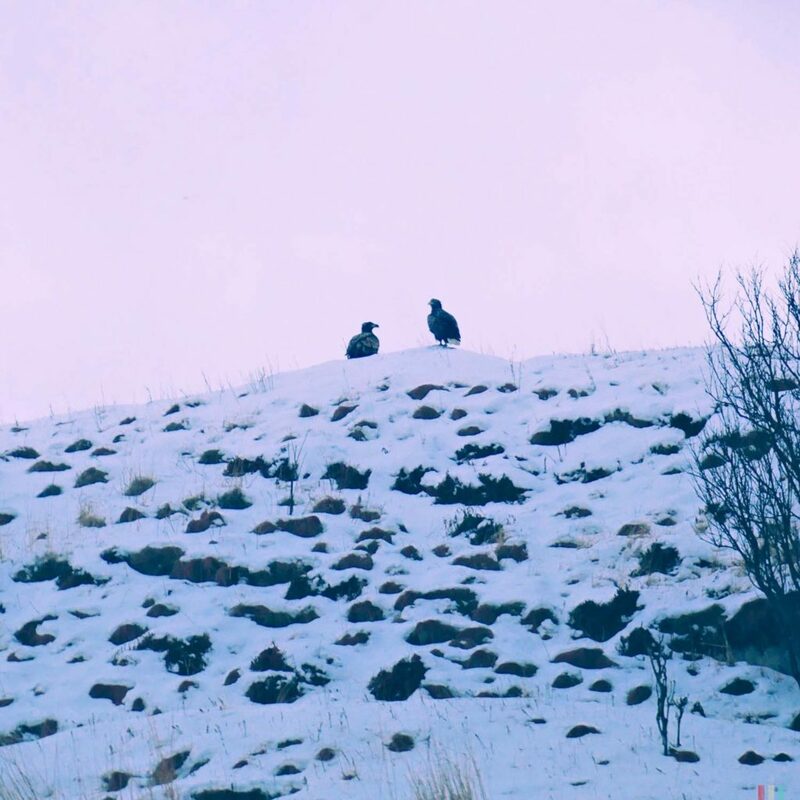 You can see eagles and seals here, and one day we even met a walrus that took a rest here while traveling from Iceland to Spitsbergen. Dag told us this might happen only every few years, so walrus-watching certainly won’t make it into the regular tourist program here. 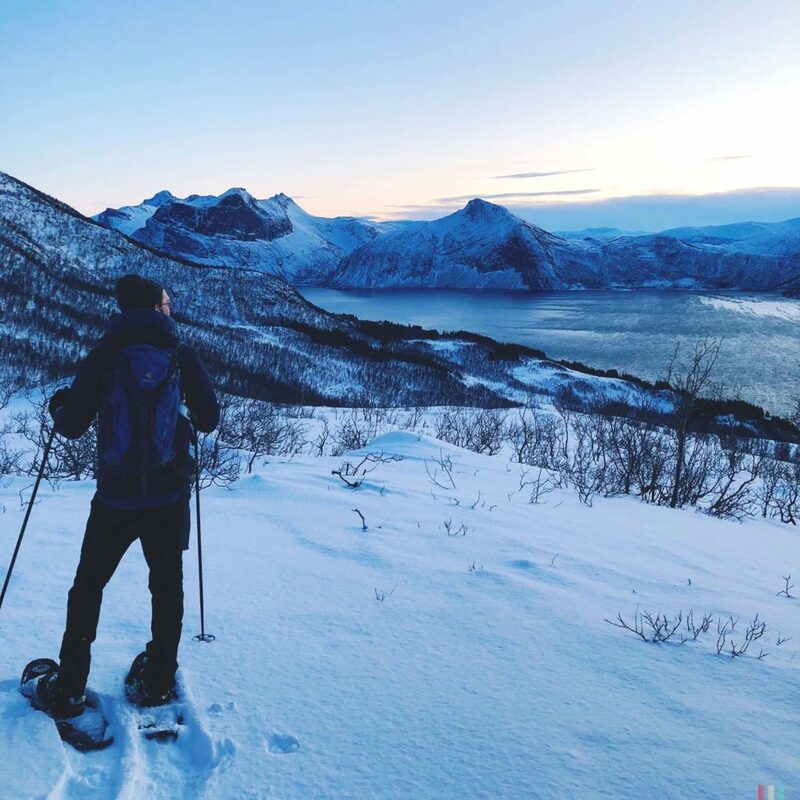 Senja offers everything Tromsø has to offer - only without the people and the city. You're right in the middle of nature here. 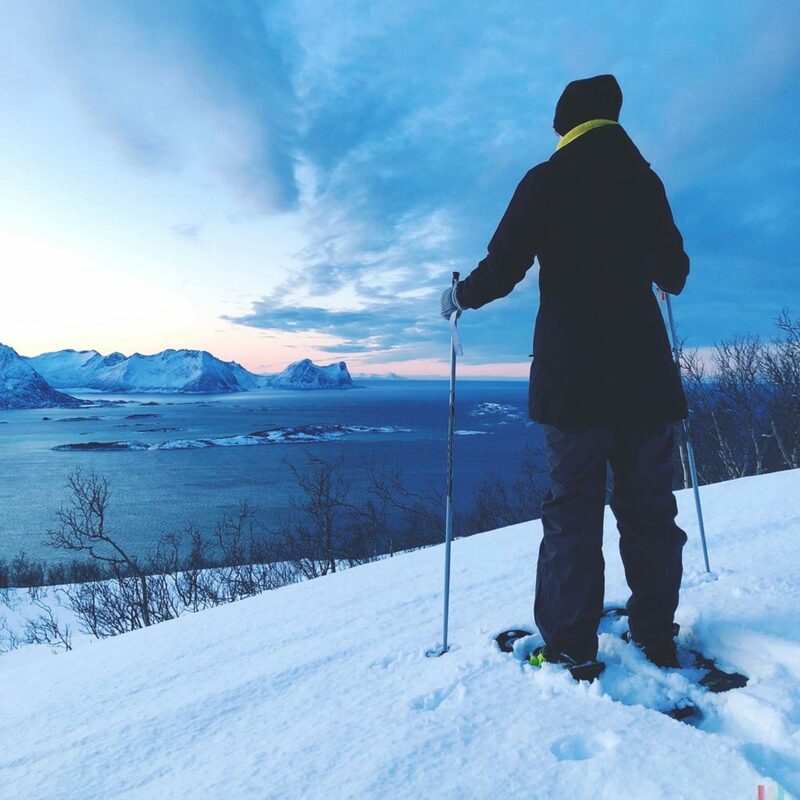 But everything else will: scenic boat trips, Northern Lights safaris, dog sledding, snowshoeing – most of the things you can do in Tromsø can also be done in Senja. Only that you’re right in the middle of nature here, with Trude cooking delicious meals – and without the noise and the people and the city. 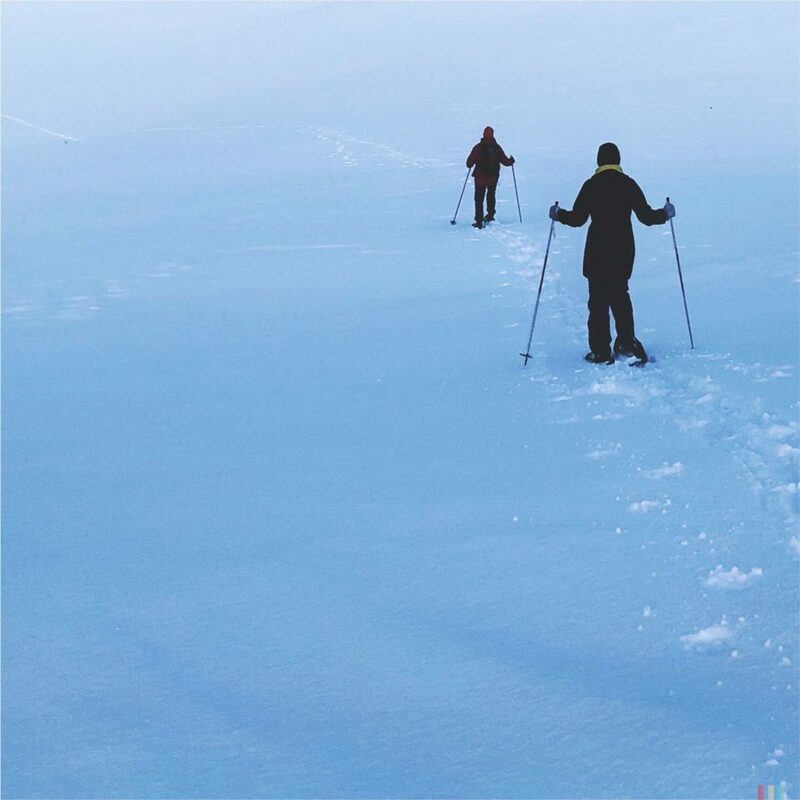 We stayed some days and did some easy snowshoeing around the fjord. You rarely get a more spectacular view than the one over the winterly Bergsfjord all the way to Andenes. We’ll be back! 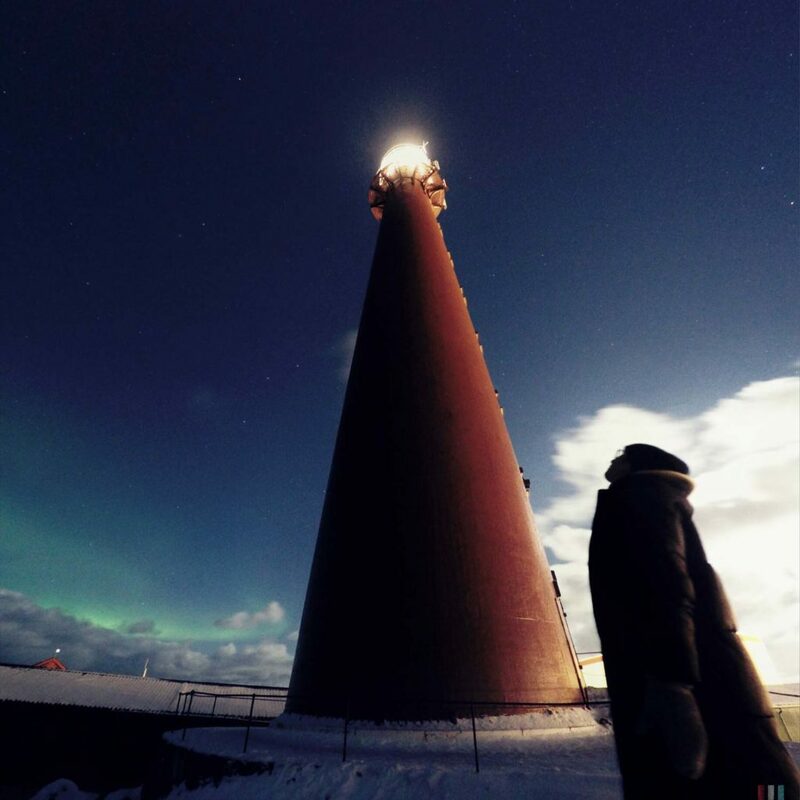 Northern Lights in Andenes. Actually we were just having dinner. But then we got an alarm from our aurora app. 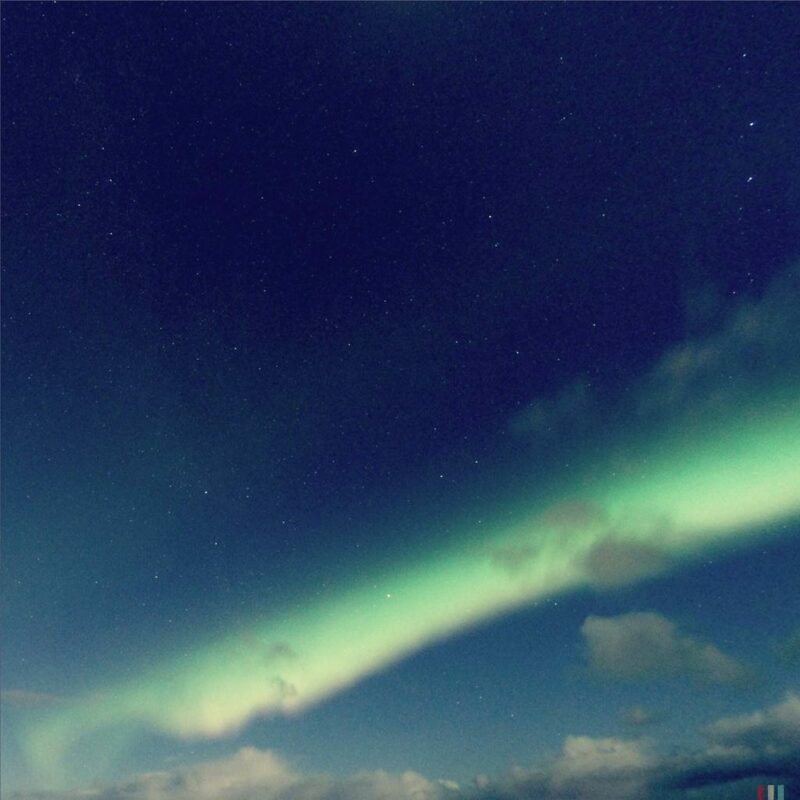 The main attraction, however, are the Northern Lights. 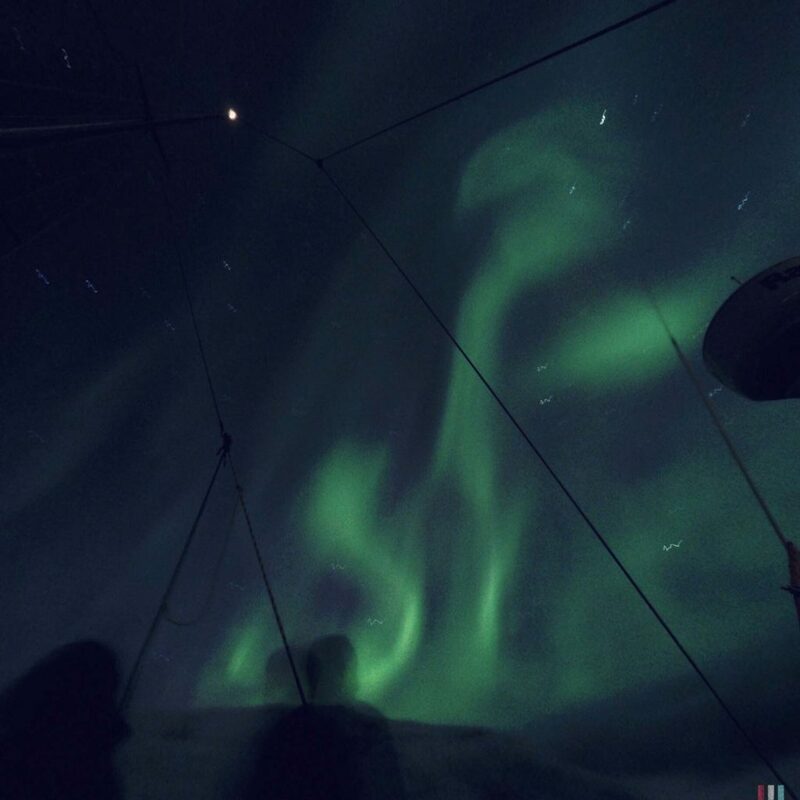 In terms of Northern Lights, 69° North is just the best of all latitudes. 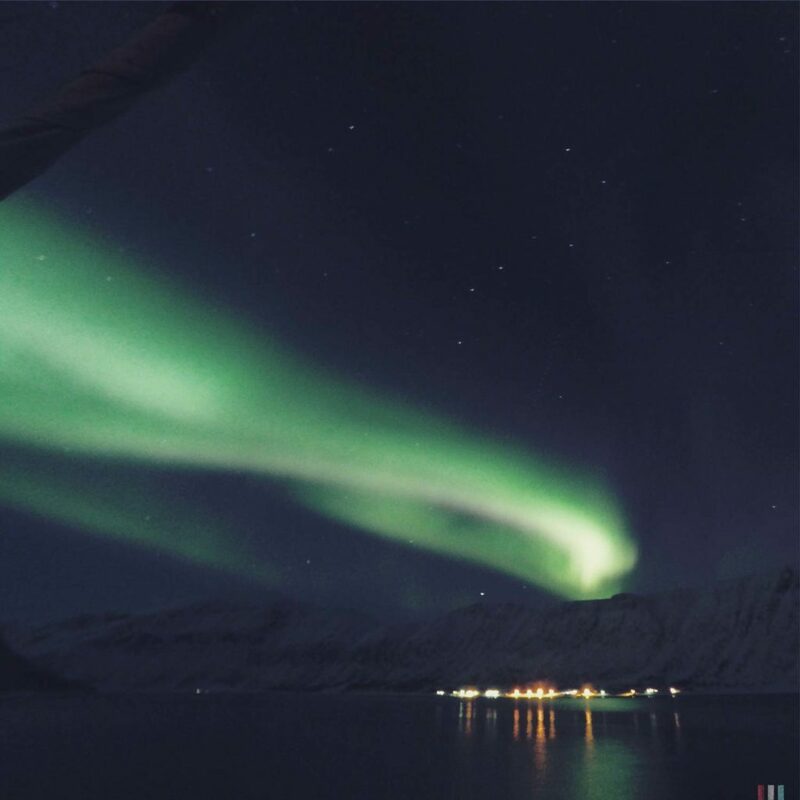 Whales or not: The most important reason why people are visiting Northern Norway in winter are the Northern Lights. Because of all the latitudes available, 69° North is by far the best to see them. 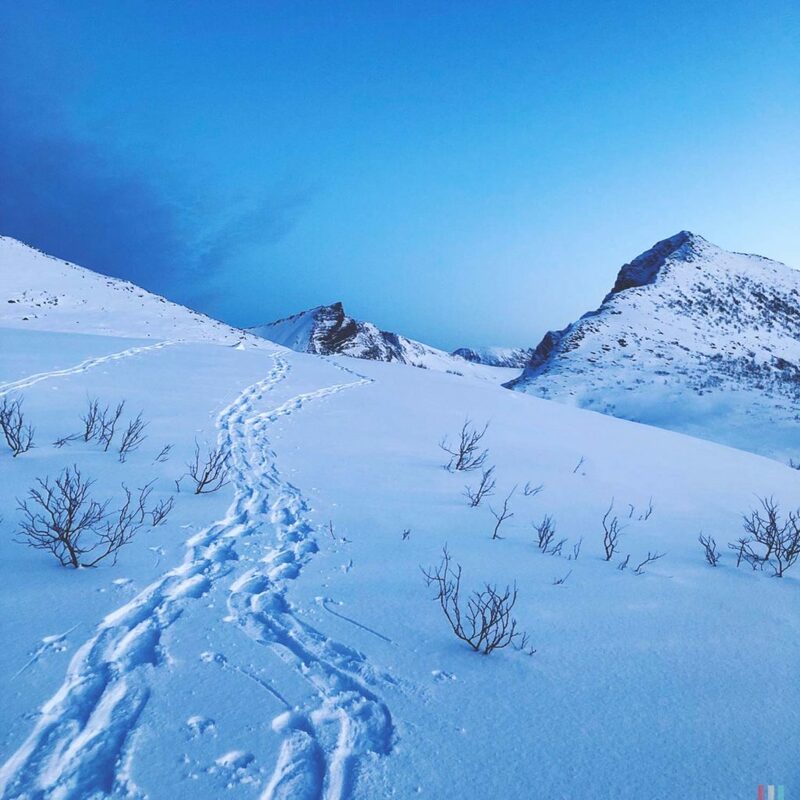 The area is far enough in the north, easily accessible in winter and right at the perfect distance from the North Pole. 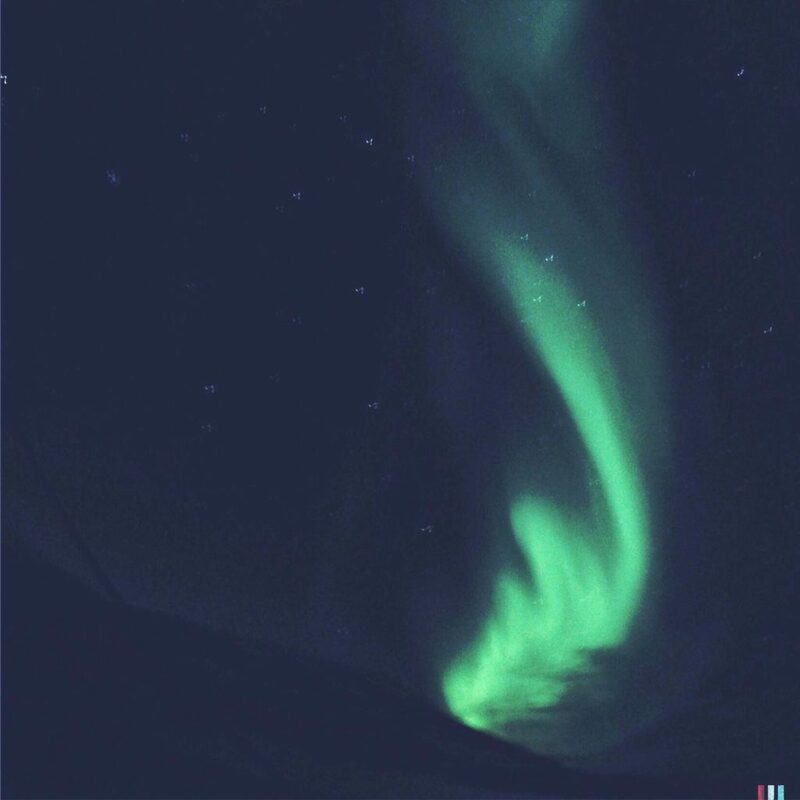 Pål Brekke explains what it’s all about with the Aurora Borealis. 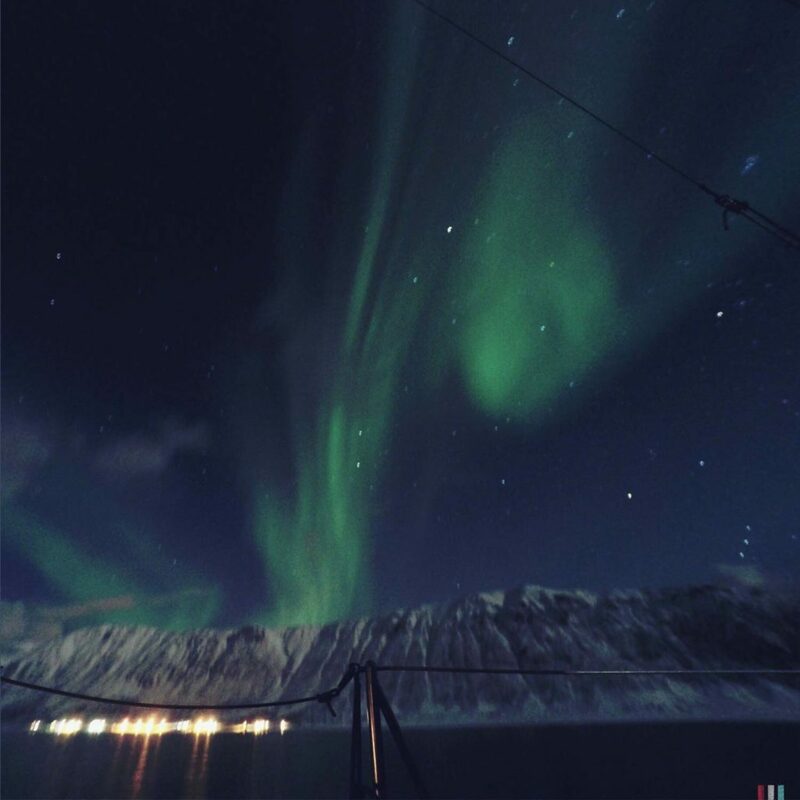 On our first winter trip through Norway I was a bit disappointed by the Northern Lights. I was expecting a lot – and then we only saw some lazy grey and green fog hanging around. No waving, no flickering, no dancing, nothing. I had hoped for so much more. 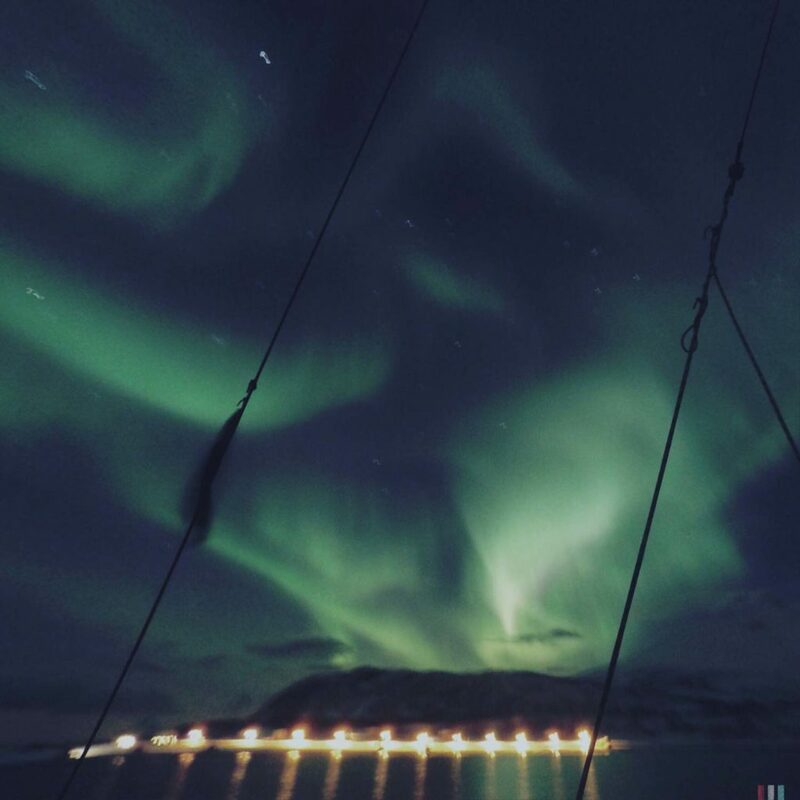 This time we were lucky: The Northern Lights were dancing as crazy and colorful in the sky as you always see it on those beautiful time-lapse videos on Instagram and Facebook. You can cruise around all night, patiently searching for the lights - or you get notified via app when it's the perfect time to go out. Another thing that got me excited: this whole technical aspect. 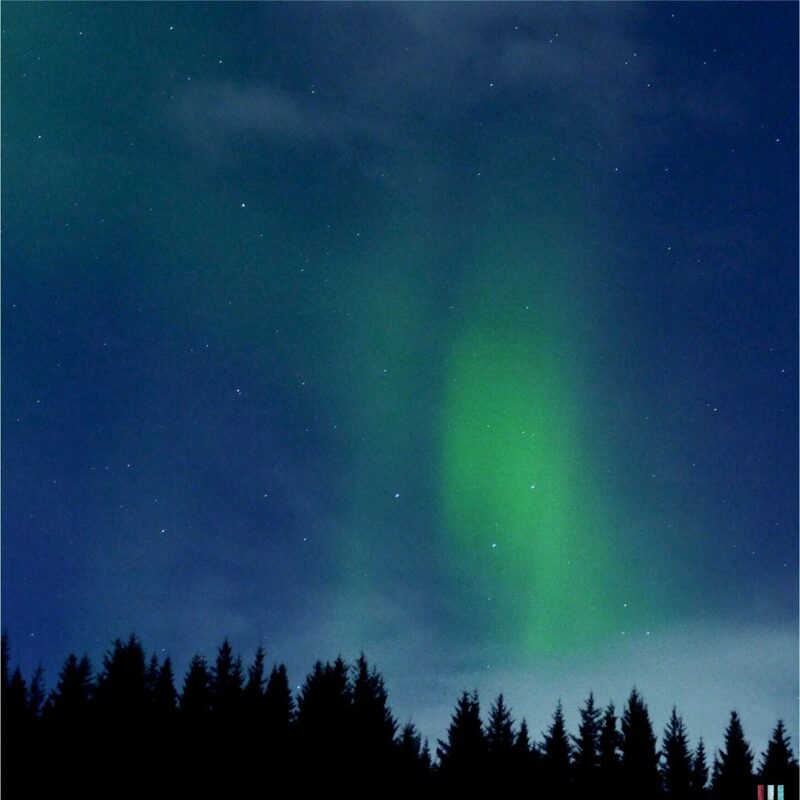 For example, there are some Apps full of Northern Lights statistics, graphs and evaluations (iOS | Android) , showing you exactly wether the Northern Lights are dancing around Siberia, Alaska or Greenland and wether they are strong or weak, and when they are supposed to be around your position. 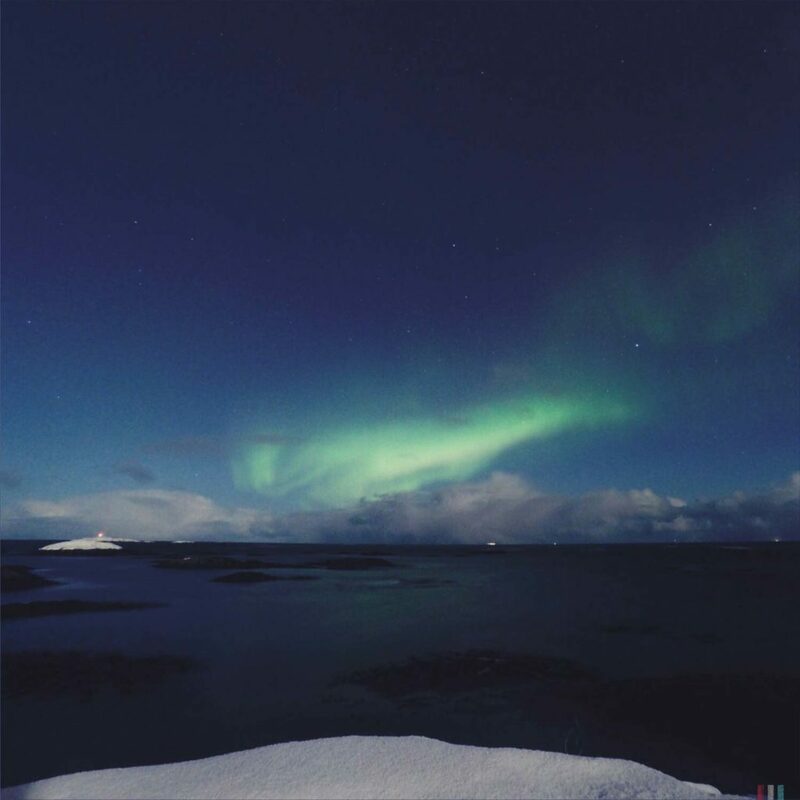 You can even customize your own Northern Lights alarm to be notified immediately when there is a certain probability of seeing Northern Lights with a certain intensity at a certain location within a certain period of time. Northern Lights on the Southern Star. 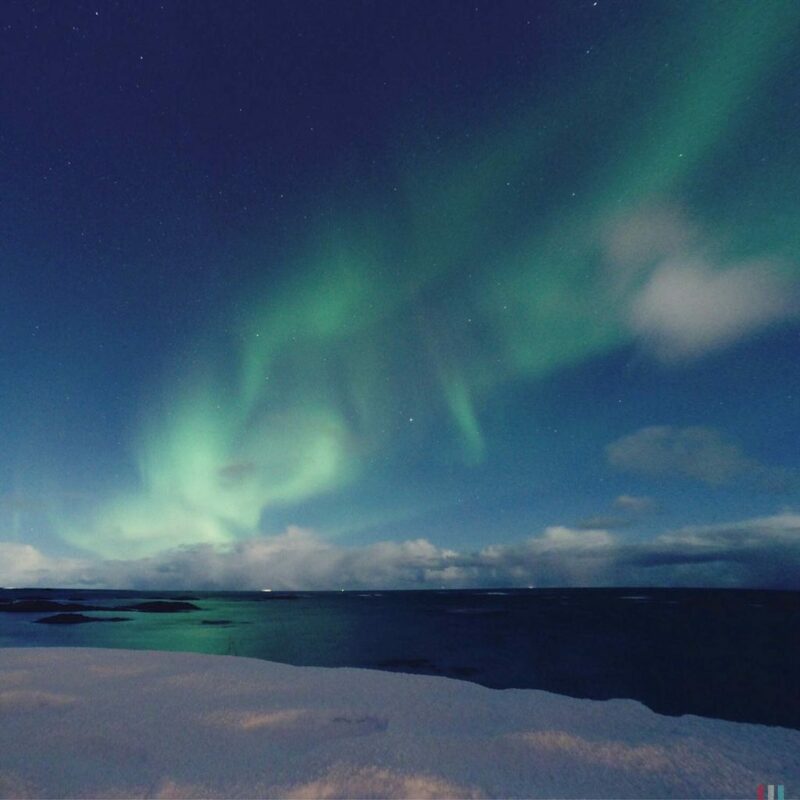 Northern Lights on the beach. Northern Lights, somewhere on the road. 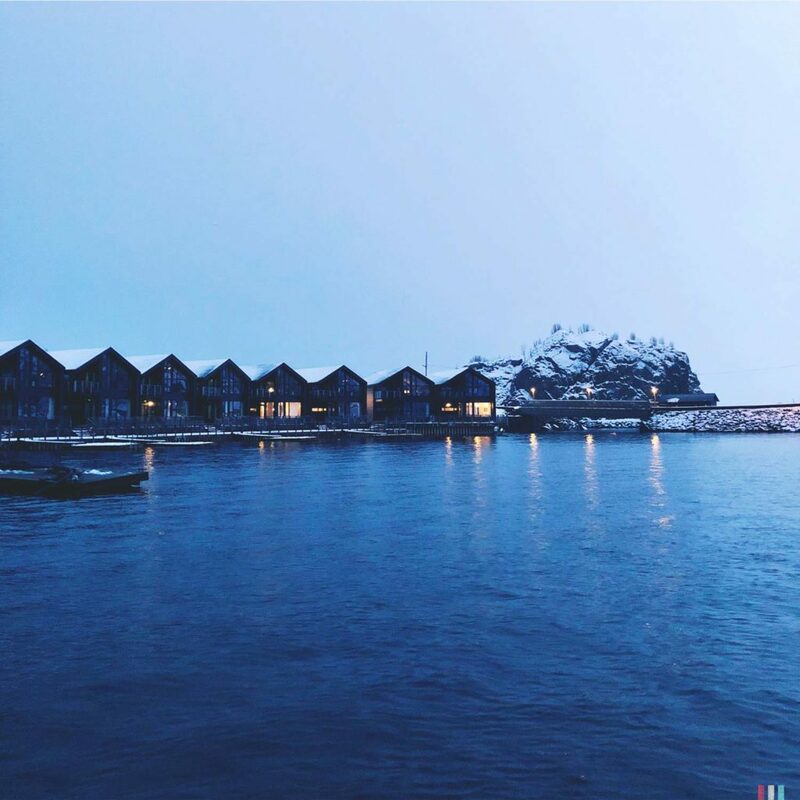 With our customized alarm, we could simply sit on board of a tiny little sailing boat in the fjords of Skjervøy or at the fireplace of a former little post office in Senja – and wait cosily until we got a notification to go outside and marvel the sky. 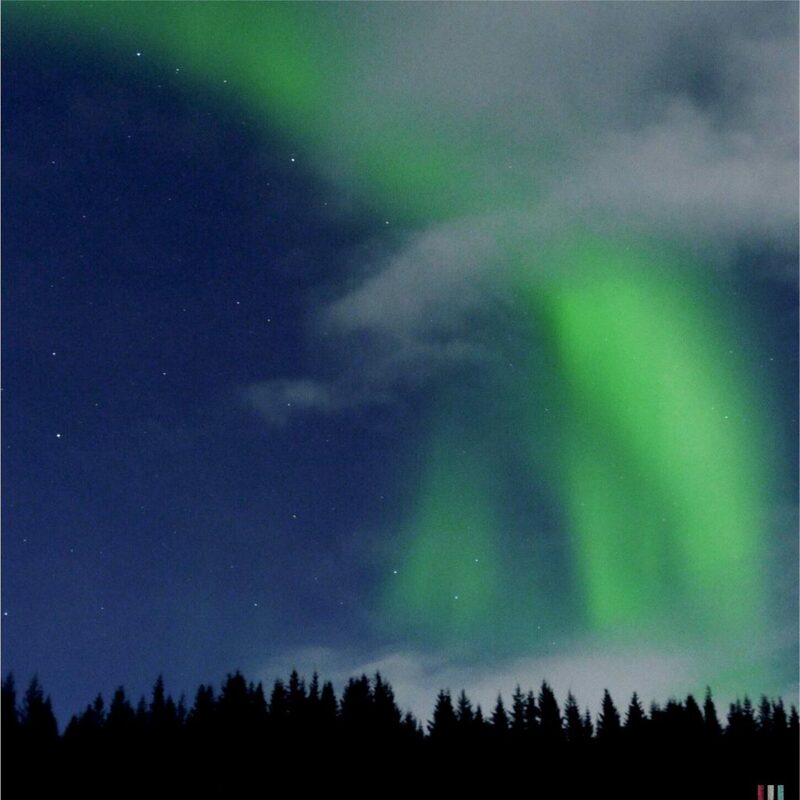 We’ve been testing this for three weeks, and it works: We’ve seen Northern Lights almost every evening. And, talking of Apps: I very much recommend the website and the apps of yr.no (iOS | Android). There’s no better way to keep an eye on the weather. 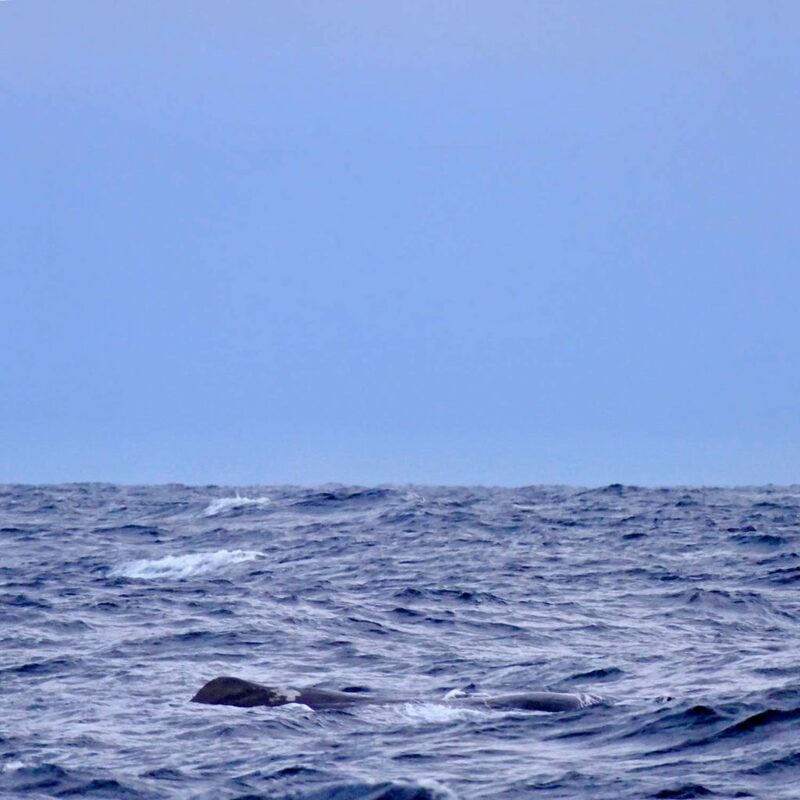 A sperm whale going for a dive at the coast of Andenes. They are full-time residents here. 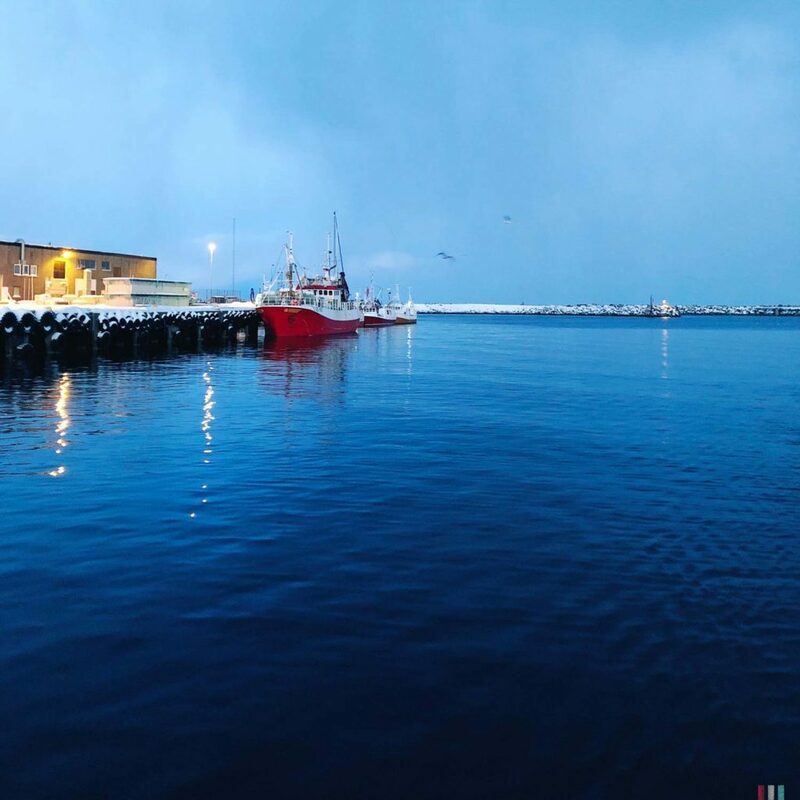 Last stop: Andenes, Norway's true whale watching hotspot with whales all year round - no matter what the herring has in mind.  Thinking of whale watching in Norway, Andenes will come to mind first. 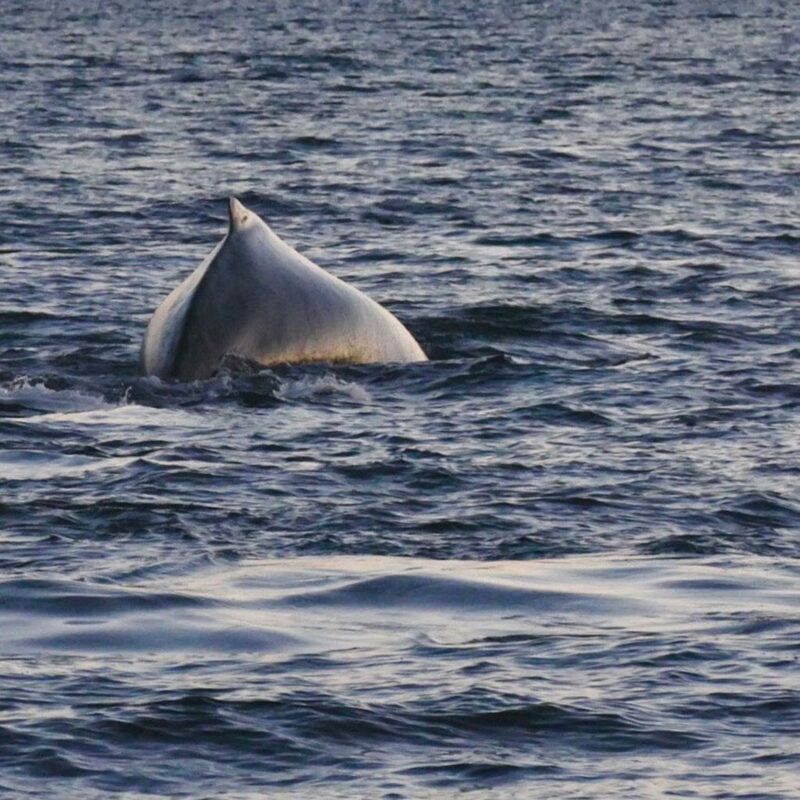 It’s the true whale watching hotspot in Norway. 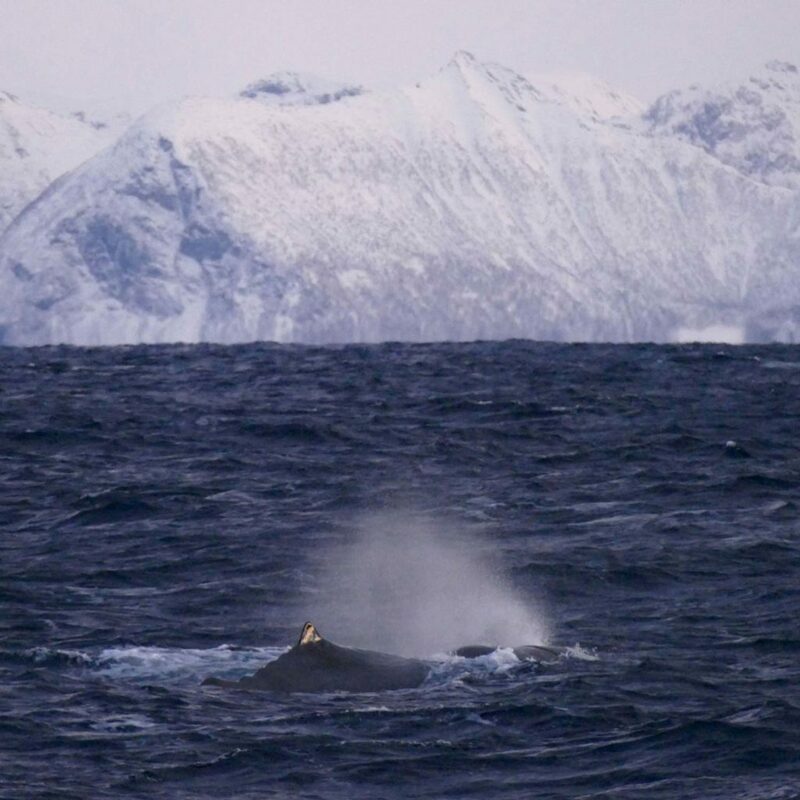 In contrast to Tromsø, Senja or Tysfjord things have been stable here for decades – in Andenes it’s not about the herring, it’s about the sperm whales. So we made Andenes the last stop of our trip. Besides the sperm whales you can meet a lot of other whales here, too, for example orcas feeding on seals not on herring. 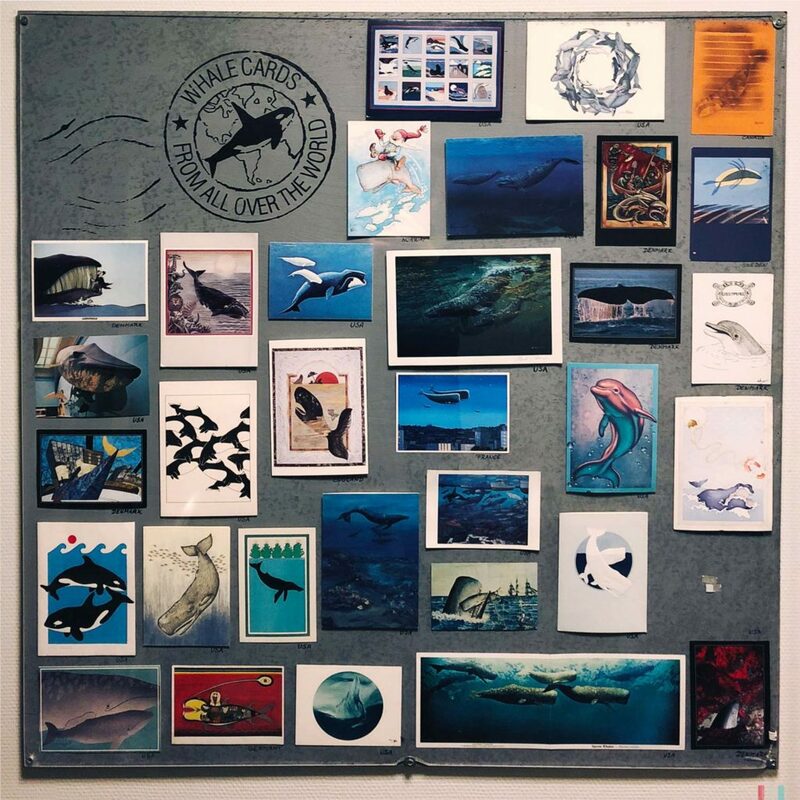 But it’s the sperm whales drawing the people to Andenes. There are only few places in the world where sperm whales can be encountered so easily and reliably. A sperm whale at the whale museum. Whale watching from the lighthouse. 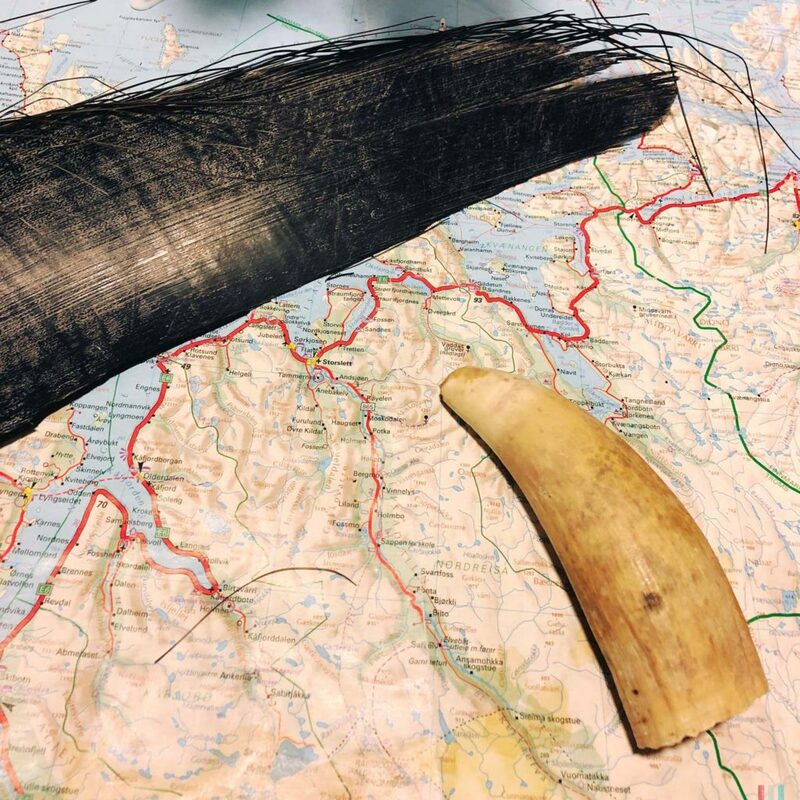 Baleen and sperm whale tooth. The streets of Andenes, 3pm. 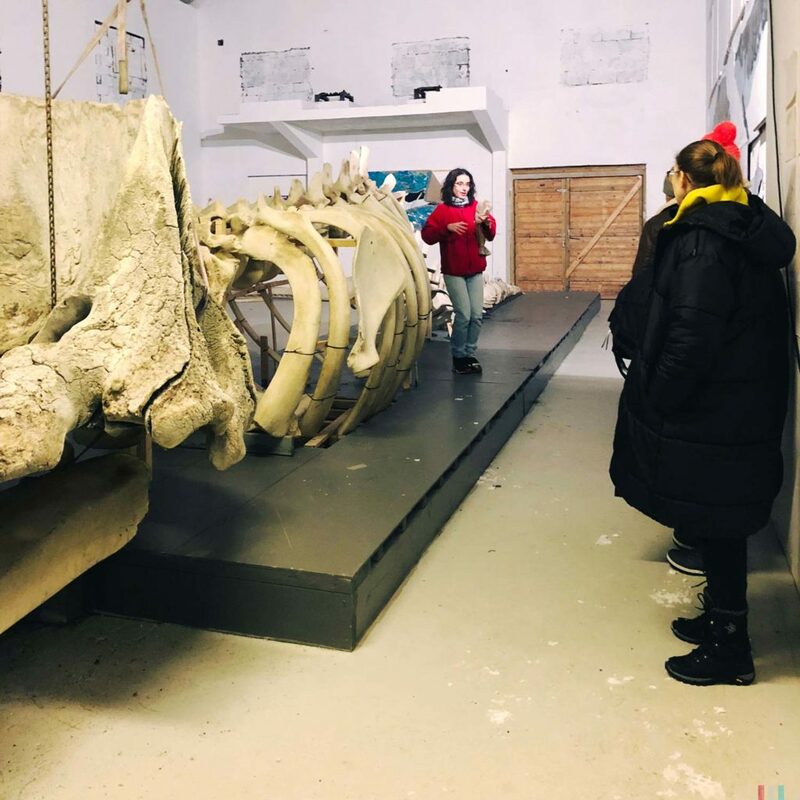 Also in contrast to Tromsø, where most operators didn’t even have their own office, Andenes also has a proper whale museum that is so much worth a visit – it’s all about sperm whales, with a (huge!) full scale model and also a real skeleton and lots and lots of interesting stuff to learn about sperm whales. You can spend hours there! 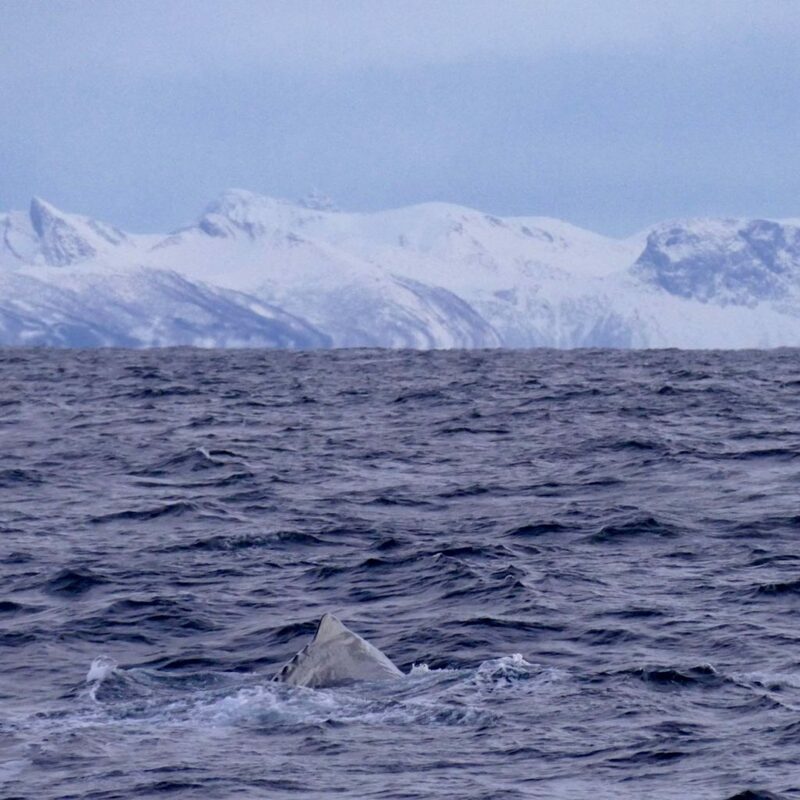 What makes Andenes such a reliable place for sperm whale watching is the mighty Bleik Canyon just outside the harbor: a huge underwater mountain range with extremely deep canyons. 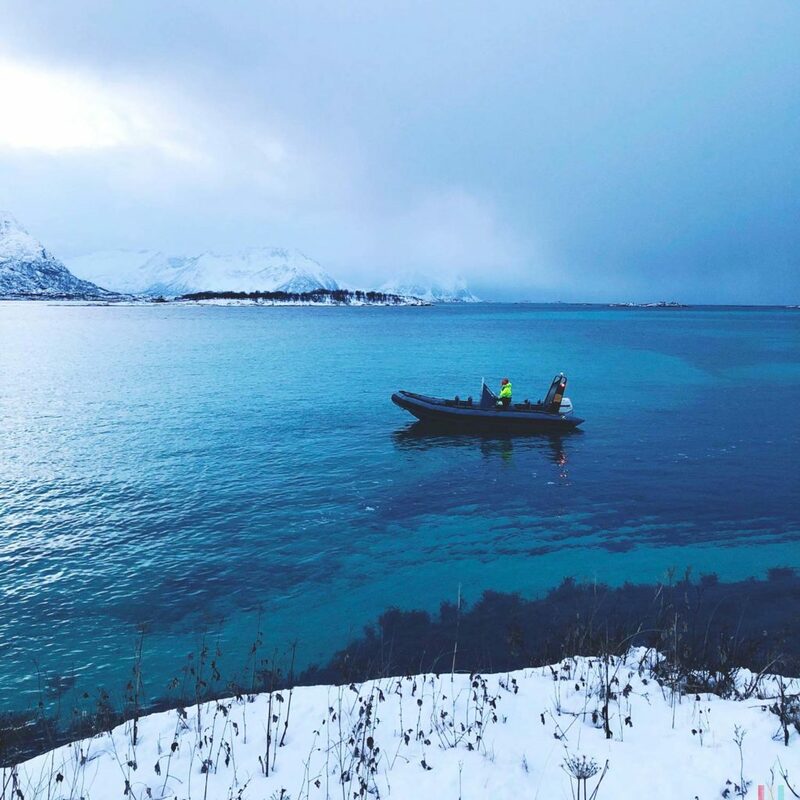 Usually such depths can only be found out on the open sea, but in Andenes it only takes a few minutes by boat to get there. 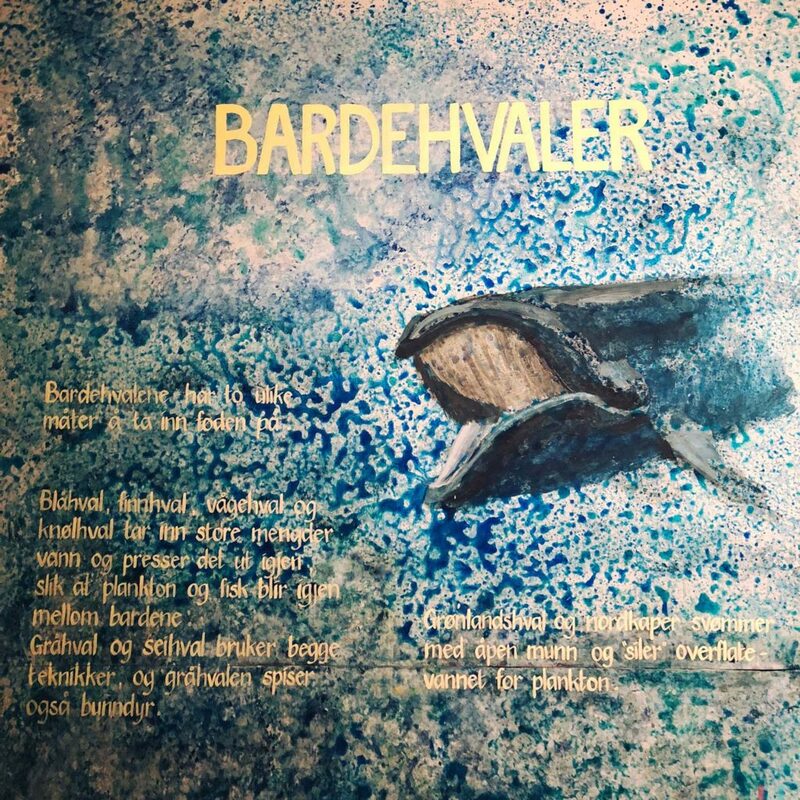 The wonderful whale museum in Andenes alone is worth a visit. 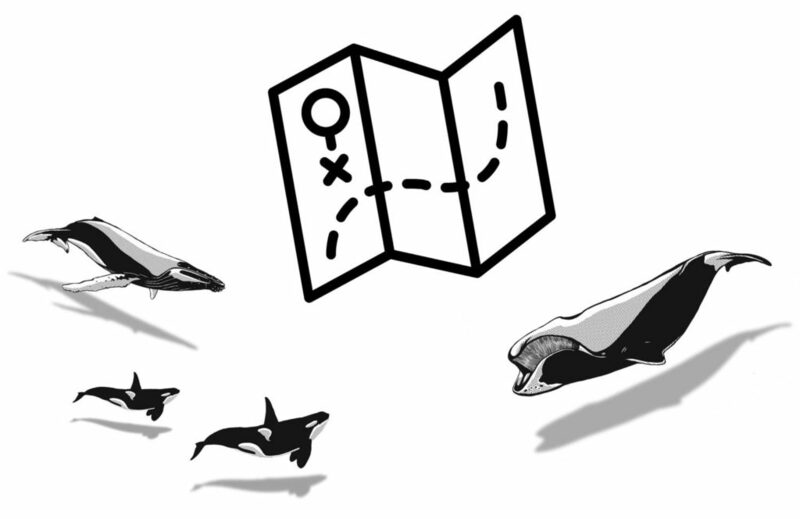 It's all about sperm whales, and you can spend hours in here. These depths are very popular with sperm whales. Sperm whales are the submarines among the whales. I’ve already written down a few times here how amazing sperm whales are, what crazy things they can do and why they always thrill me so much. With Theresa it’s the orcas, with me it’s the sperm whales. It’s always been like that. And because of the sperm whales we had already visited Andenes a few years ago. It was summer then, we were wearing t-shirts, with the midnight sun high in the sky. 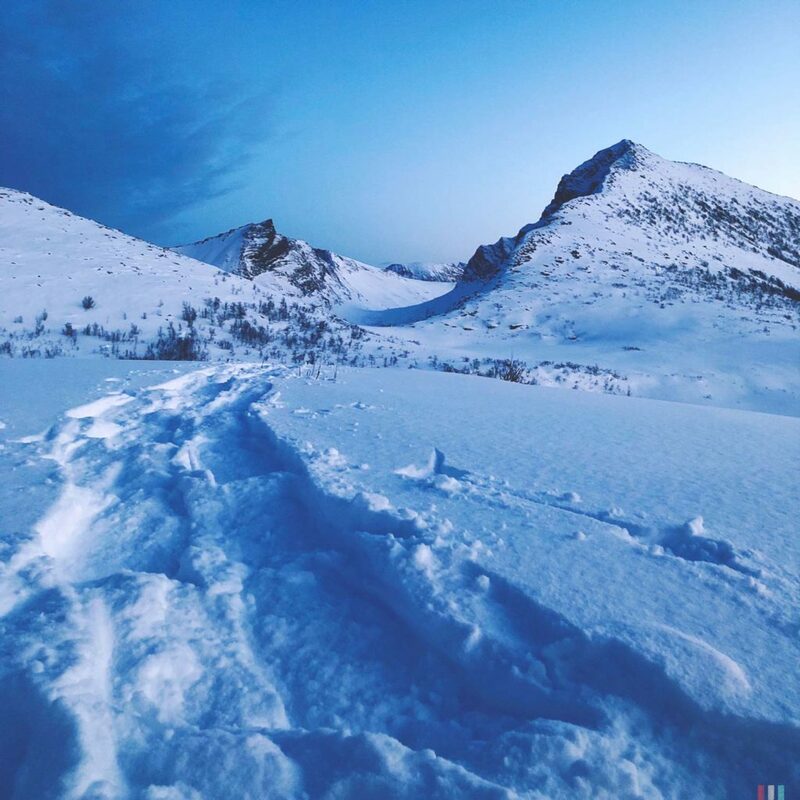 This time we got that icy crisp blue of the arctic light. And again, the sperm whales. If you like sperm whales, you should definitely have been to Andenes at any time of the year. Theresa having some beach time at the Bergsfjord in Senja. 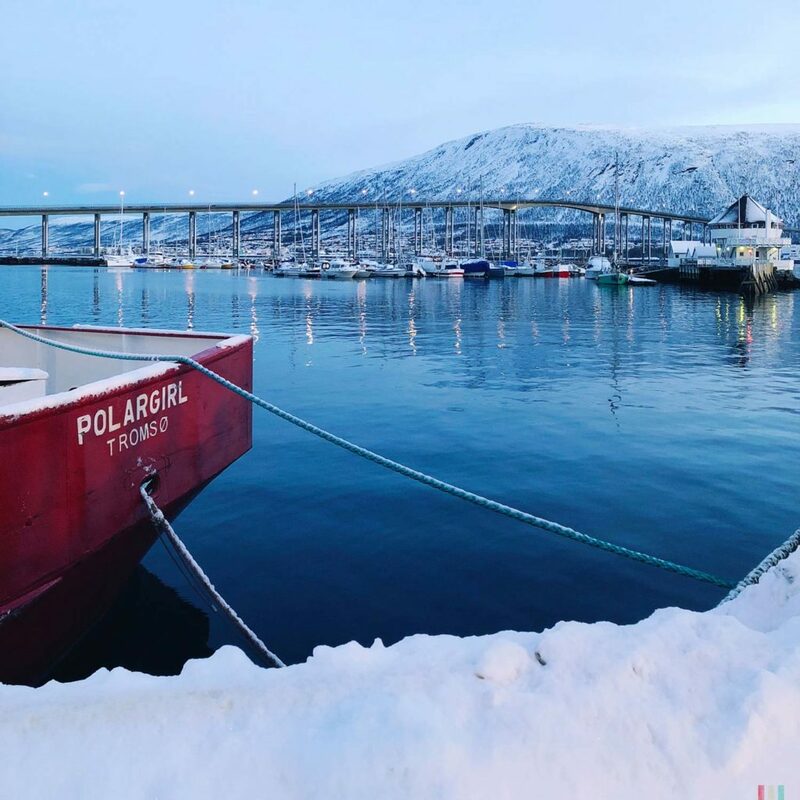 In short, Northern Norway is the place to be in winter. But you better keep an eye on the herring. So, what's the plan for the next year? The guide telling us how far north we were right at the beginning of our trip, fortunately also gave us some good travel advice for the next winter whale watching season. Alta! 70° North. In Winter. Sounds great!